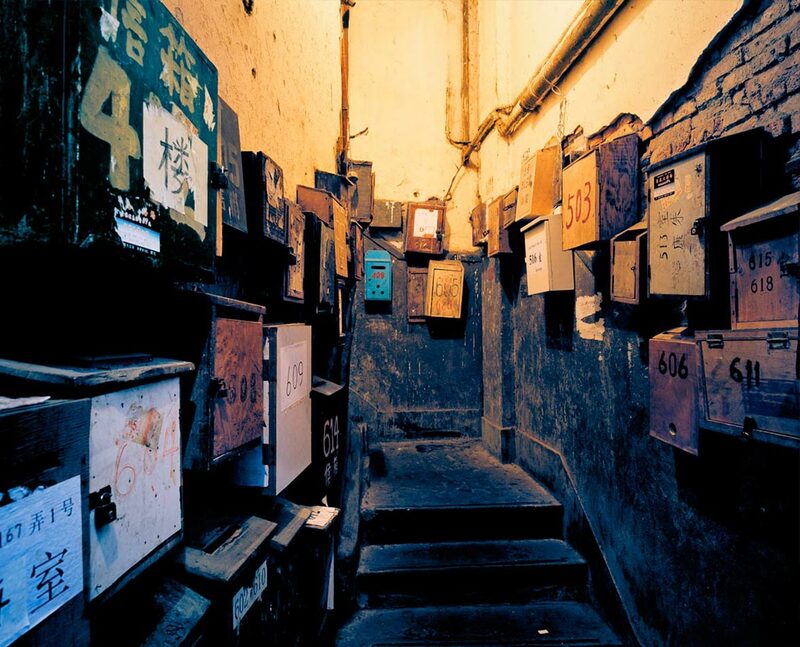 Canadian photographer Greg Girard has spent much of his career in Asia. As a result, many of his works are candid and stunning documentations of the social and physical transformations that have taken place throughout the continent. Some of his most well-known photo series capture moments and places that are now long gone, washed away with the changing times. Recently, Neocha spoke with Girard about Phantom Shanghai, a hauntingly melancholic photo series that documents the city’s jarring and rapid transformation into the skyscraper-filled behemoth that it is today. 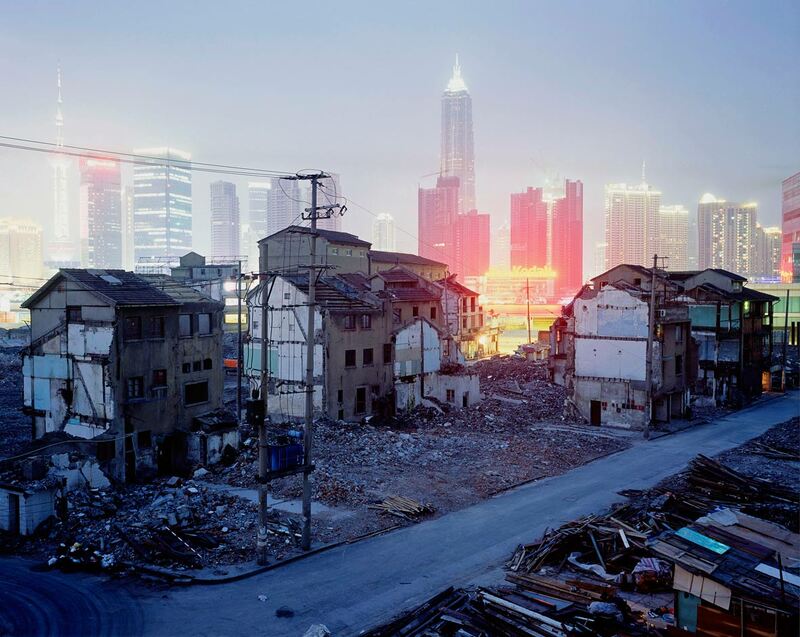 Neocha: Urbanization happened rapidly, and even violently at times, in China. 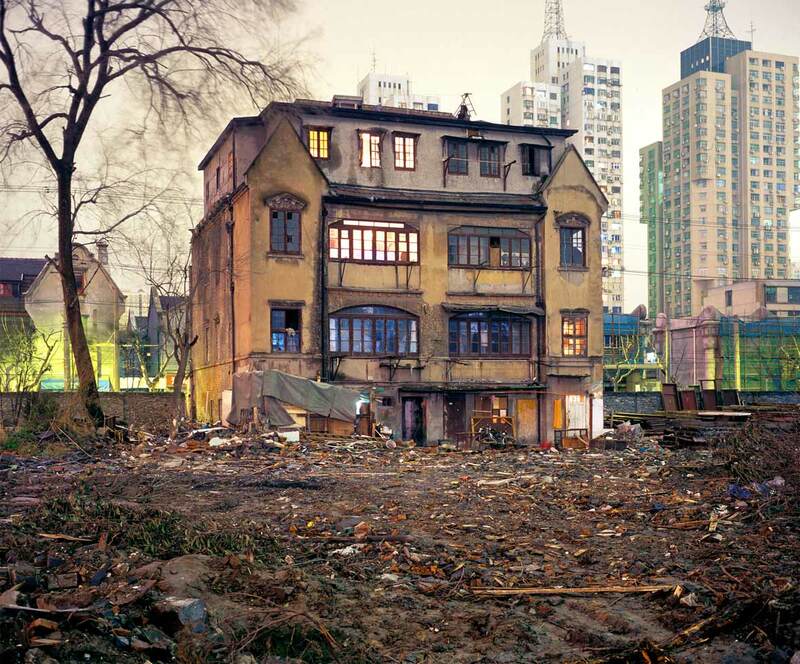 House demolition has always been a very controversial and sensitive topic in China. How did you feel when you first saw these ruins in the centre of the city? 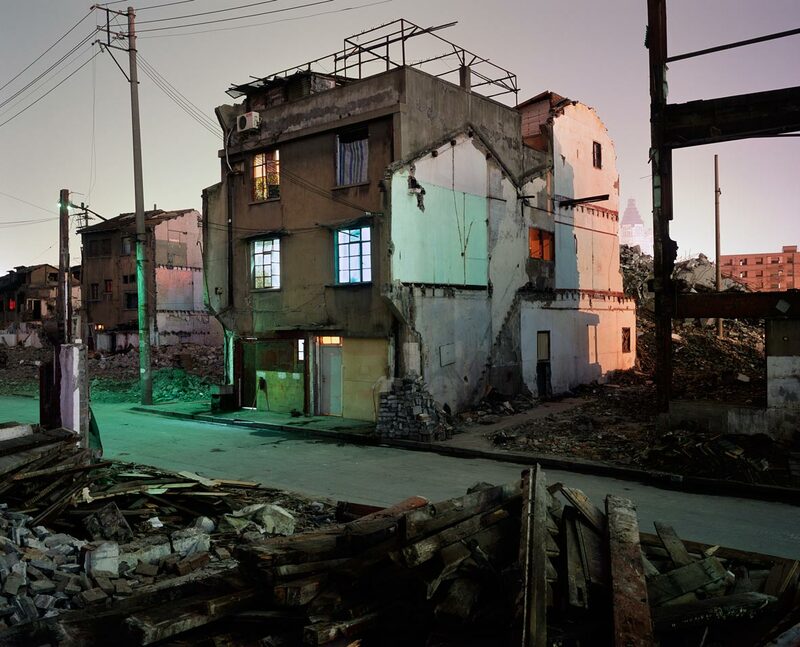 Greg Girard: What struck me was less the ruins themselves, but more so the fact that people were still living amid them as buildings were being demolished—sometimes even the very building they lived in. 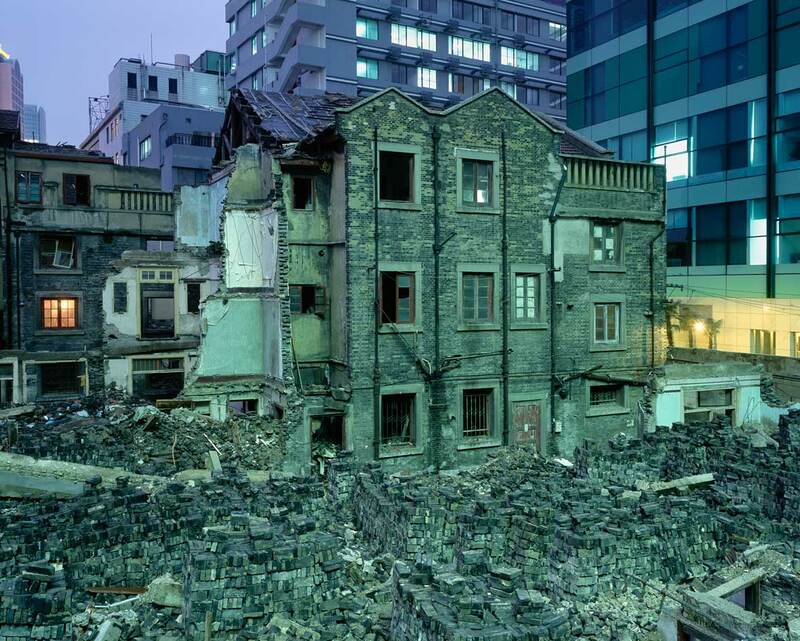 The occupancy wasn’t always apparent during the day, but in the evening you could see the lights in the windows of the still-occupied homes, signs of life amidst the rubble and half-demolished buildings. Those scenes suggested defiance at one extreme, and obliviousness at the other as this wave of demolition and construction swept through the city. 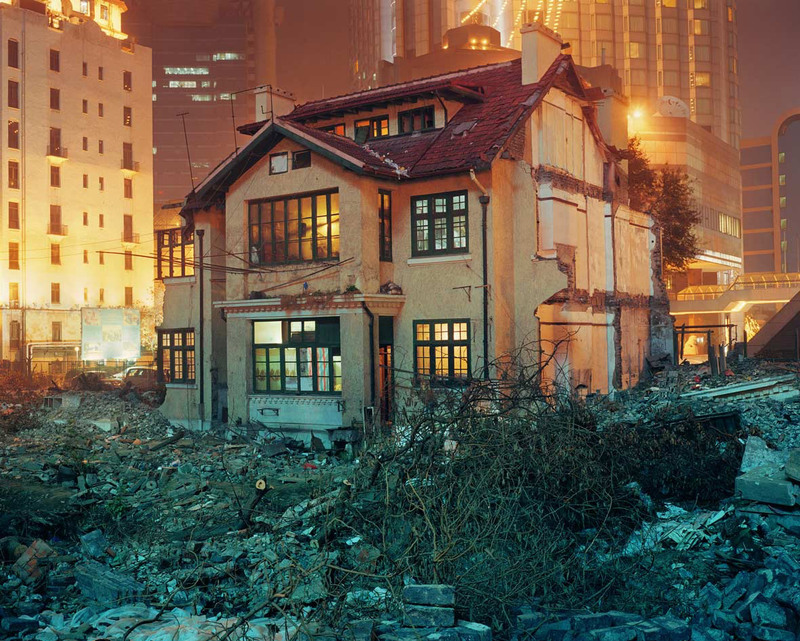 Neocha: The idea of house demolition is a familiar yet unfamiliar occurance for me and many people who grew up in a Chinese middle-class family. What makes it familiar is that we constantly see news report about demolition disputes on TV, but most of us actually never experience it. From a perspective of a foreigner, how do you feel about these demolitions? Greg Girard: China was more or less isolated for three or four decades (from 1949 onward). The familiar churn of urban development for profit didn’t take place in the gradual way that it does in most large cities in capitalist societies. It started happening all at once, which was during the 1990s in Shanghai’s case, after Deng Xiaoping declared that Shanghai should “catch up”. 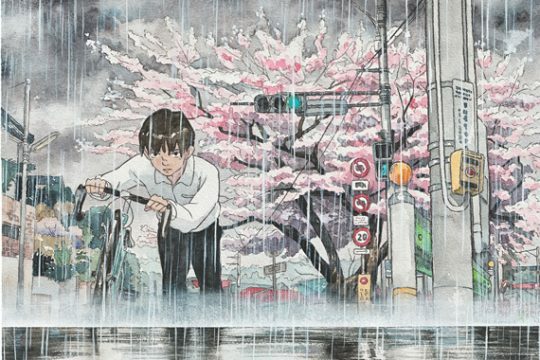 And so the city experienced urban demolition and construction that usually might take place gradually, over decades, happening on a scale and at a pace that had never been seen before. It was terrifying, and fascinating, and to some extent sad. Clearly there was an opportunity to preserve individual buildings, and entire neighborhoods even, that were architecturally significant and historically valuable; an opportunity, it turned out, that would be ignored on a breathtaking massive scale. So, on one hand there was a sense of a squandered opportunity and on the other there was the sense that it was an accident that the buildings and neighborhoods, preserved by indifference and neglect, had survived as long as they had. 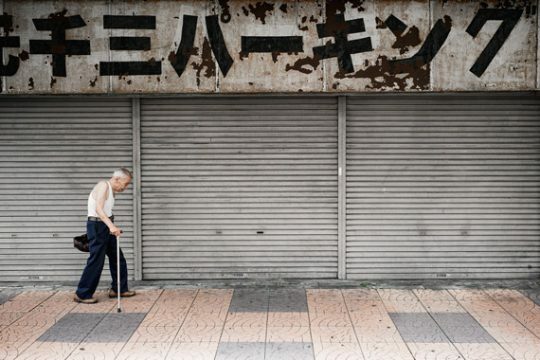 Neocha: Because of the rapid urbanization in China in the last few decades, for many locals, their memories on many things is disconnected. 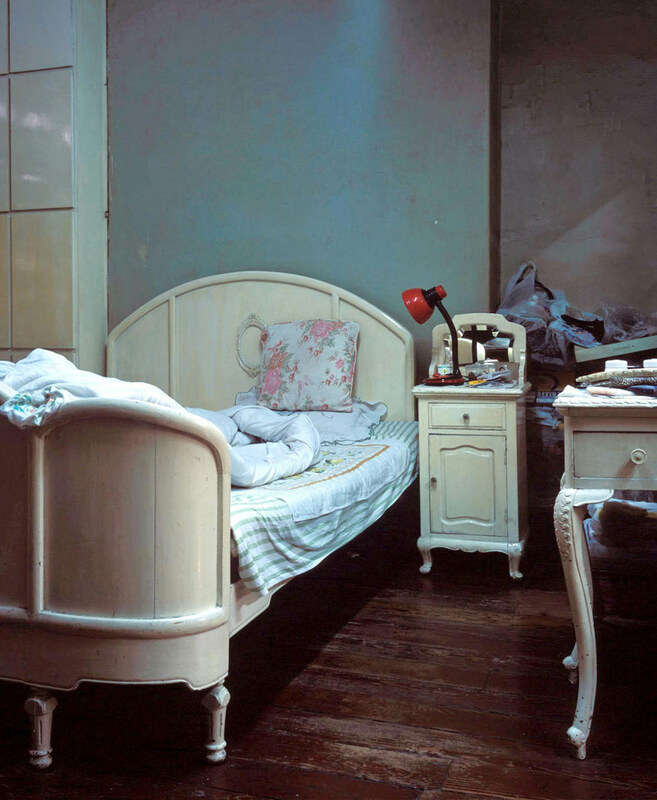 Part of this series seems very intimate, such as the shots of bedroom or bathroom. When you went into their very private space, did you talk to the people who live there? When facing this rather vulnerable group who are unable to fight back against the massive strong arm of the government, it almost feels like their memories are being erased. 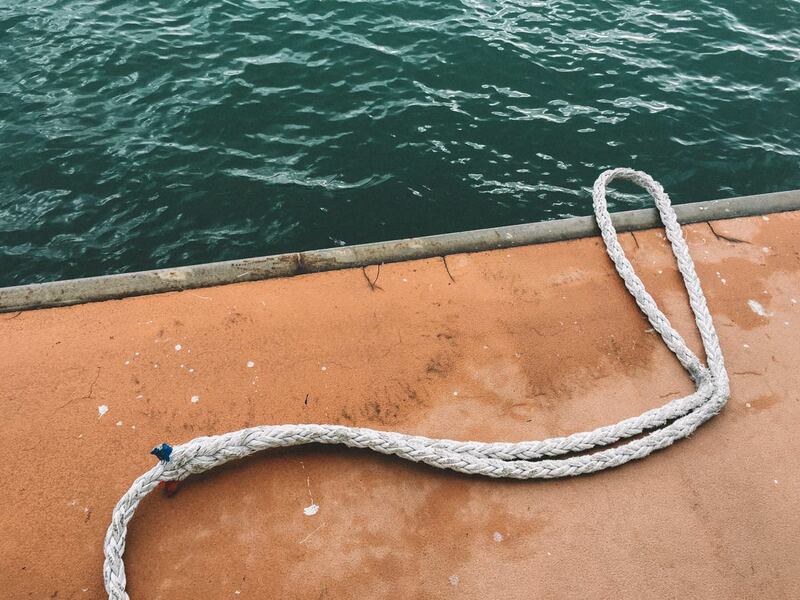 Are you attempting to capture a certain sense sadness in your work? Greg Girard: I was fortunate that people were, for the most part, willing to allow me into their homes, including bedrooms and bathrooms, when requested. The shared nature of domestic life was one of the elements I was trying to show. For example, homes built for one family that had been subdivided to accommodate multiple families. What does that look like and how does it work? In other cases, I simply wanted to see the choices people made in terms of how they lived and what they saw when they went to bed at night or woke up in the morning, knowing in many cases that these homes were of the verge of being demolished. So, I think it’s not wrong to say, as you do, that memories are being erased. As for sadness: Yes. Helplessness in the face of the unchecked power is of course tragic. Neocha: The houses in your works almost looks like an island on top of ruins. To me, it seems to represent both persistence and resignation. Many people forced to relocate have mixed feelings about house demolition; some people are actually thankful since it allows them to move into a much nicer apartment and receive monetary compensation from the government. Others rather stay in the place where they grew up. What’s your take on this? What are some of the more memorable moments of shooting this projects? 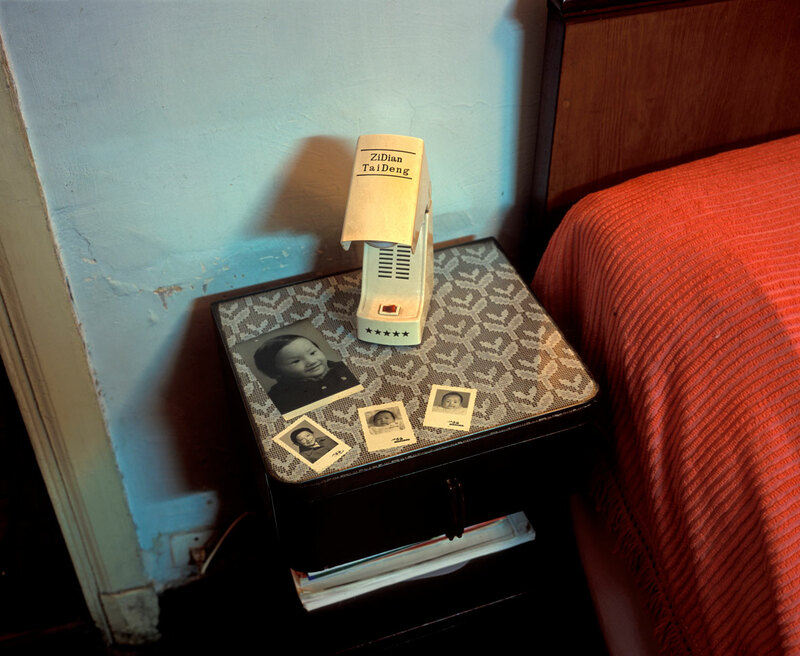 Greg Girard: During the beginning of the project (2000-2001) when I set up my tripod and camera and was photographing in a neighbourhood, I was often asked by residents if I (or someone) was planning to buy the property. Because, as you noted, this could mean that the tenants (those with residency rights rather than actual ownership) would be entitled to resettlement in a self-contained apartment. Most of these older buildings were not meant to house as many people as they did, which meant that residents had to share a kitchen, a bathroom and toilet facilities. These places looked quite grand—in a faded sort of way—from the outside, but on the inside they were very difficult to live in. Most of them, in their public areas, hadn’t received a coat of paint in forty, fifty years, or more. Photographing inside one hallway, I remember thinking that the peeling paint on the walls had probably been applied at some point in the 1930s. Neocha: Urban redevelopment has always been a major goal of Chinese urbanization. However, the interesting thing is that old Shanghai’s architectural style is extremely complex, being a mixture of European and Chinese style, which gives shikumens their unique character. But after the redevelopments, they’re becoming more and more modern. The unique character of the city also seems to be fading away alongside. What is your take on this? Greg Girard: I think it’s quite rare for a government—whether in China or wherever—to make enlightened choices about architecture or public space or understand the projected experience of being a city dweller. So I’m not surprised when a union of government and property developers produce ghastly results. Having said that, I am surprised when something decent and human comes out of that, as it occasionally does. Neocha: We can see the demolished building is next to the modern skyscraper, one side is the scene of the broken and destruction, another side is a fancy shopping mall. This contrast is often seen in your work, is it intentional? 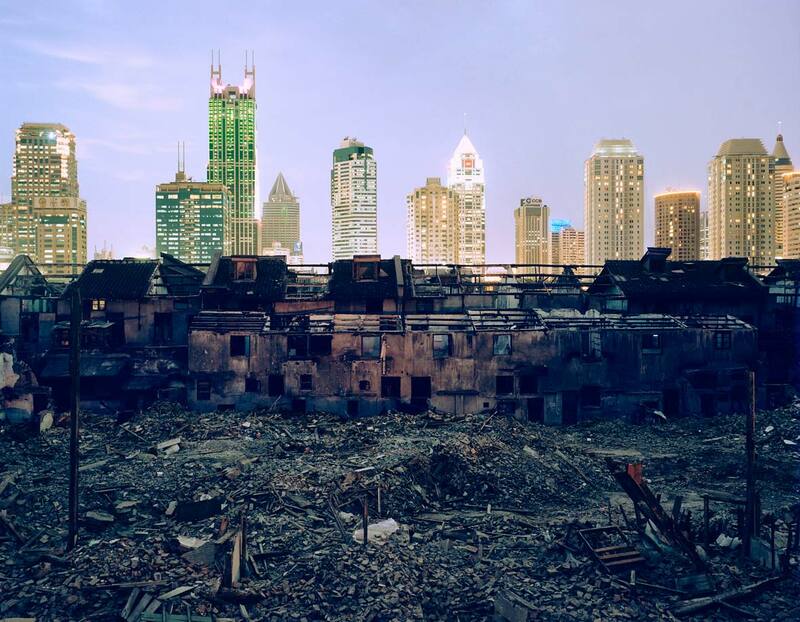 Greg Girard: As much as those sorts of contrasts can result in boring clichéd pictures, the scope of what was happening in Shanghai meant that those contrasts were inescapable. The challenge was how to show that without making a cliché. But at the end of day, if the pictures manage to escape being clichés then it’s only because the demolition and construction was happening on such a scale that it doesn’t make sense for the photographer to frame things artificially to illustrate a tired cliché. That scene was the absolute reality. And so, to make these pictures without showing this historical moment of “contrast” (by showing, for example, only intact, romanticized, historic neighborhoods) would have been unthinkable, artificial, a lie. Neocha: This series of work was completed almost ten years ago, have you revisited these locations you shot? When you see it has changed to skyscrapers, how you feel about that? Did you ever wonder where are all the people who live there? How their life was? 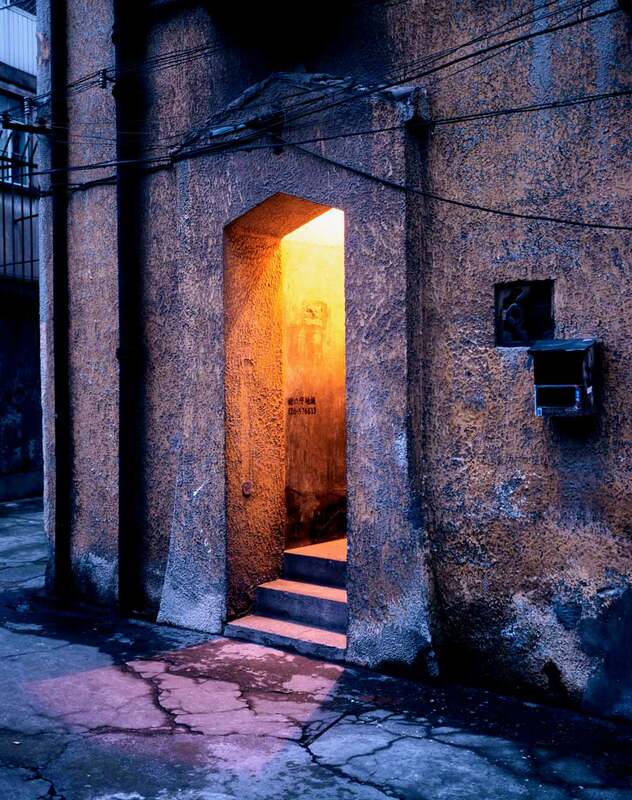 Greg Girard: I still visit Shanghai fairly often, though I tend not to seek out the locations I photographed when I worked on the project between 2001 and 2006. Sometimes I come across them by accident though. 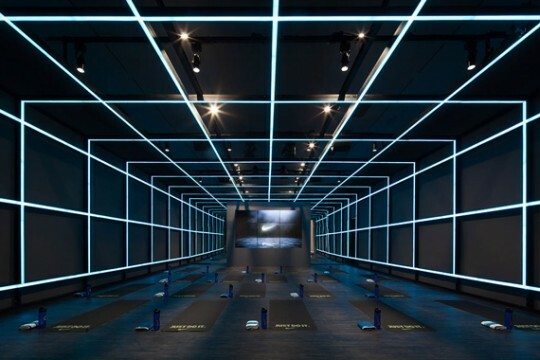 Visiting a new museum, a restaurant, a friend’s apartment, or driving on a new road, I might realize that something looks familiar and think, “Didn’t this used to be here…?” But then the moment passes and you’re back in Shanghai’s latest version of itself. 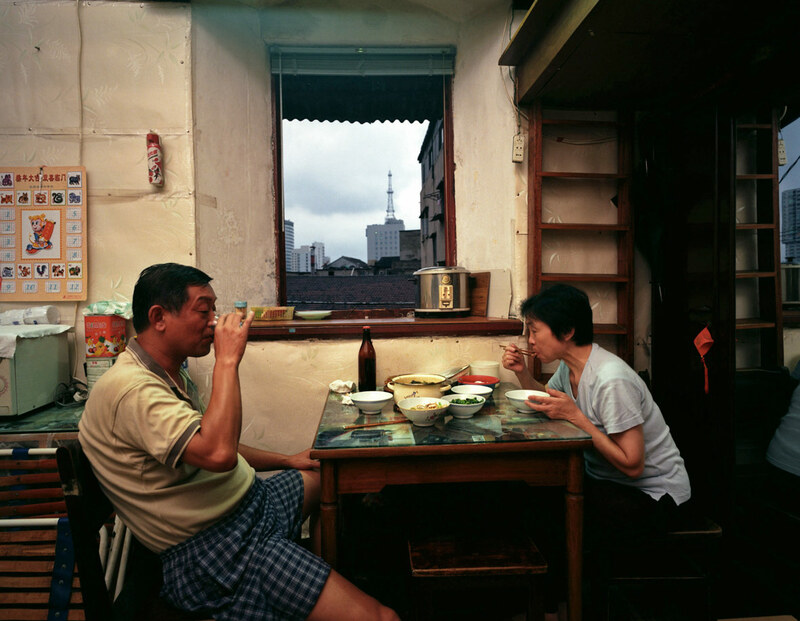 Neocha: You works seems like a documentation of memories of city, compare to other city that you shoot or lived before, such as Hong Kong, Hanoi or Vancouver, is there anything that makes Shanghai feel different from the rest of these cities? 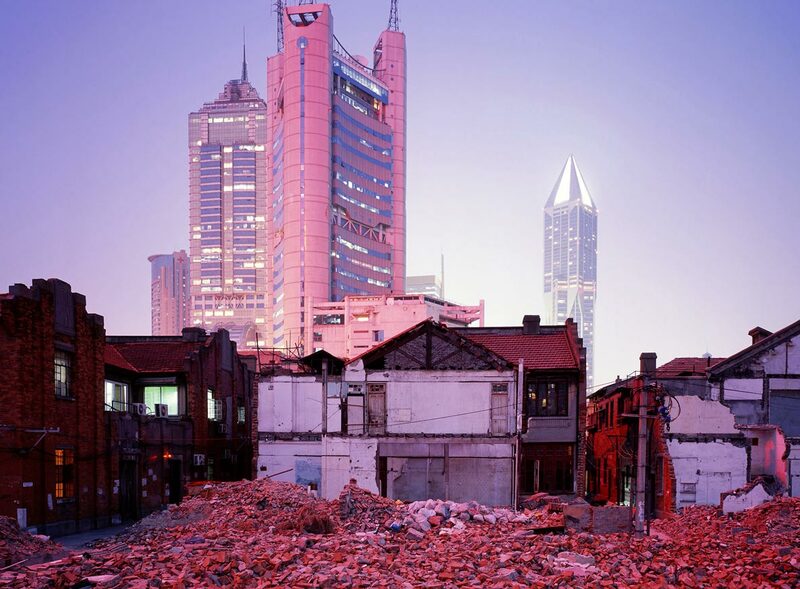 Greg Girard: I first visited Shanghai in 1983, and at that time the city’s built environment was almost completely unchanged from 1949. It was like arriving in a city that had been frozen in time, in terms of its surface at least. Only the street signs, having been entirely renamed after 1949, appeared to have changed. Much later, in 1998, I moved to Shanghai from Hong Kong, and amidst the vast redevelopment taking place, I still had this memory of being in the city not too many years ago and realized how much had changed since then. 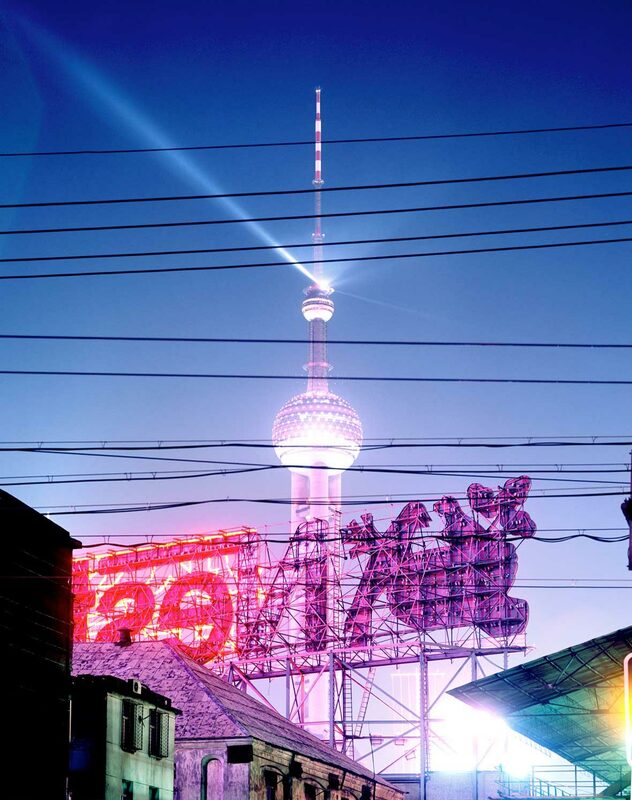 I knew that I didn’t want to make something nostalgic about “disappearing Shanghai”, but at the same time, I felt that what I was seeing was unprecedented. Already there was a growing sense of loss at the disappearance of so many historic buildings. 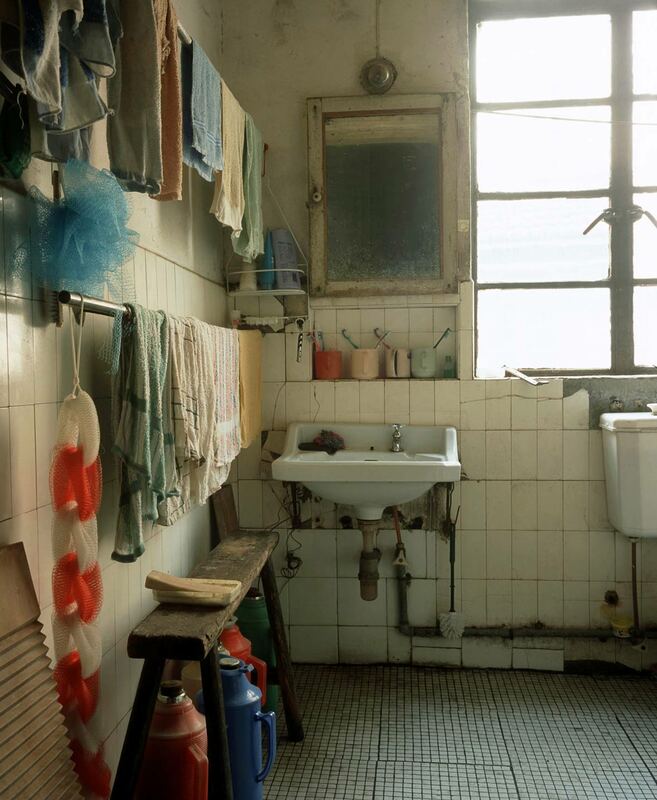 But from what I’d already seen, taking photographs inside some of these buildings, I felt that it was more than the buildings themselves; it was a whole way of life in Shanghai that was disappearing: living in close quarters in lane housing and in individual buildings, where neighbors had to share more of their lives than they might necessarily want to. In other places, I’d always photographed the “now” without thinking too much about “then”. 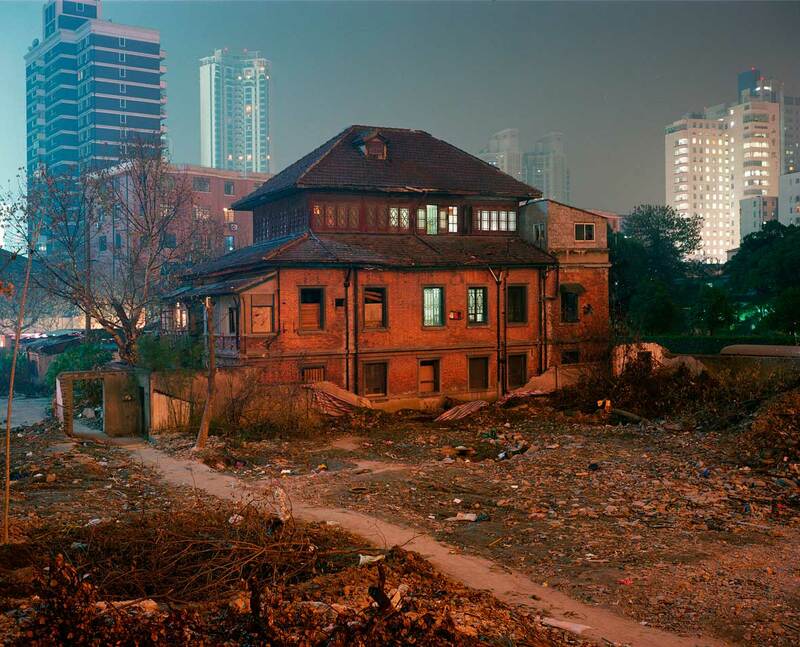 But in Shanghai it seemed I was photographing right inside the rapidly closing gap between “now” and “then”. That gap was actually there and photographable, though it was clear that it wouldn’t be for long. 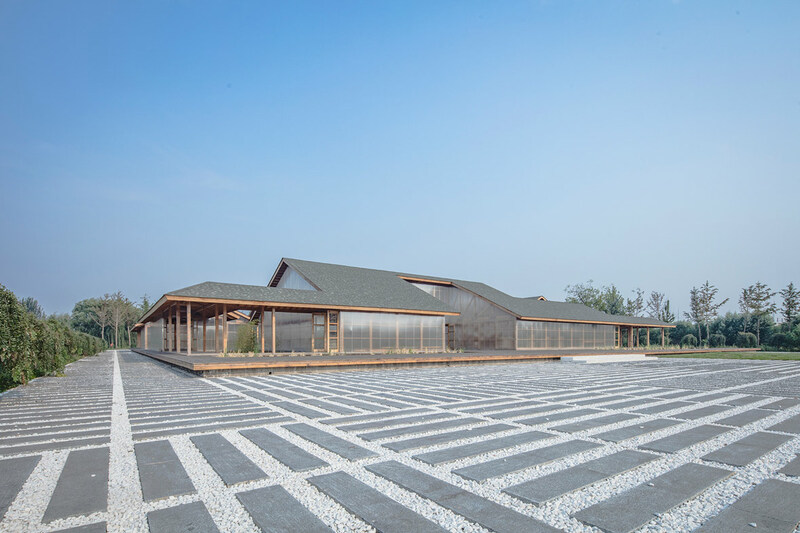 Having previously completed impressive architectural and interior design projects throughout China such as Beijing’s Rongbaozhai Coffee Bookstore, Arch Studio was commissioned to design Organic Farm, a 6000 square meter compound located in the outskirts of Tangshan City’s Guye District. 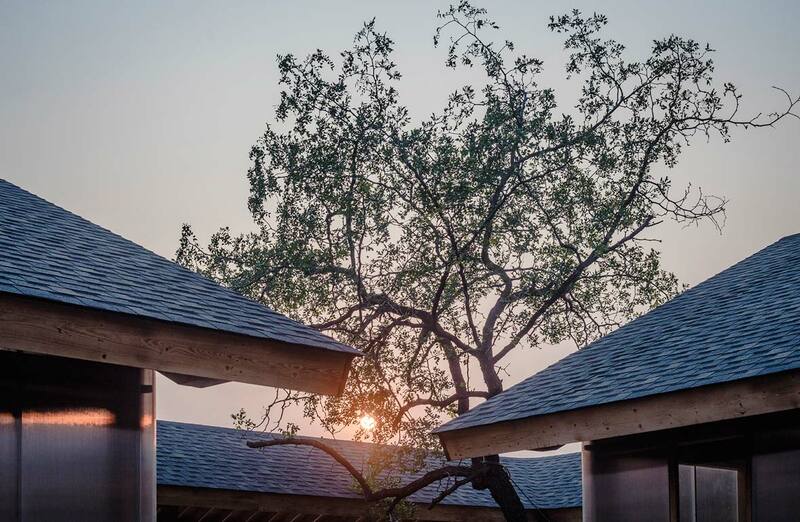 The distinct architectural design stands out amongst the sprawl of villages and private residences in the surrounding area. 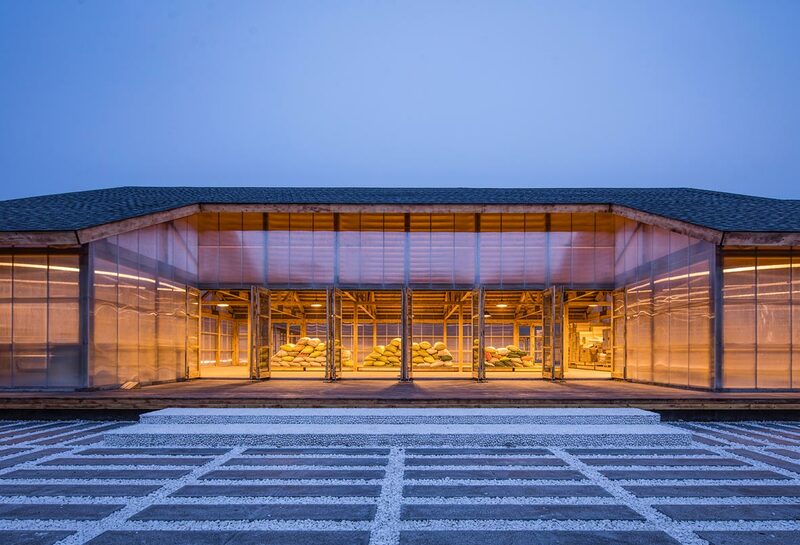 As the name suggests, the main purpose of the building is to function as a processing workshop of organic food. Raw materials are sent from organic producing regions across the China are processed and packaged to be retail-ready. Many of the organic products here are then transported to homes and supermarket all throughout China. 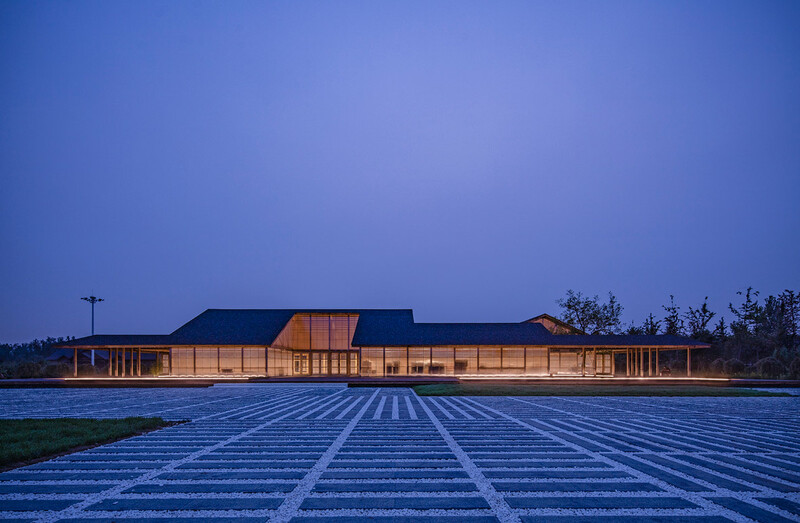 The design concept behind this building is inspired by siheyuan, a traditional residential design where a large courtyard is flanked by buildings on all four sides, a design commonly sees in northern China. 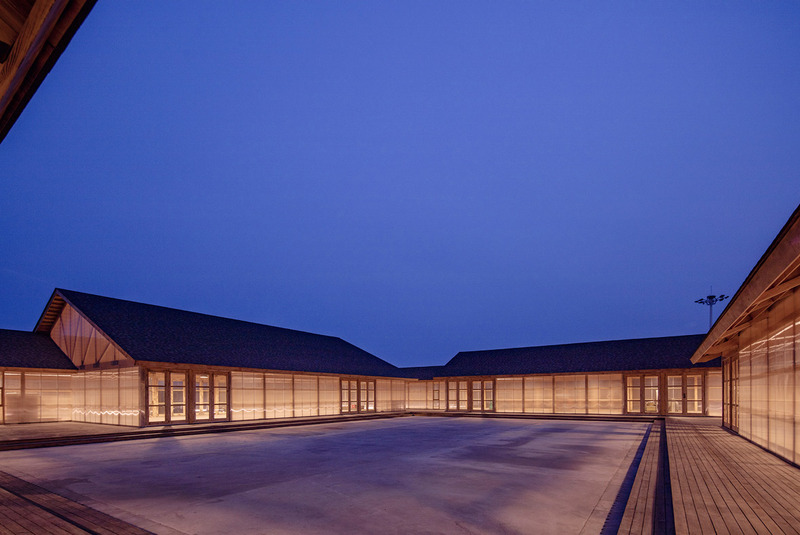 Organic Farm’s skillfully executed this traditional architectural style on a much larger scale. In doing so, they’ve create a natural atmosphere and a functional workspace that allows flexibility. 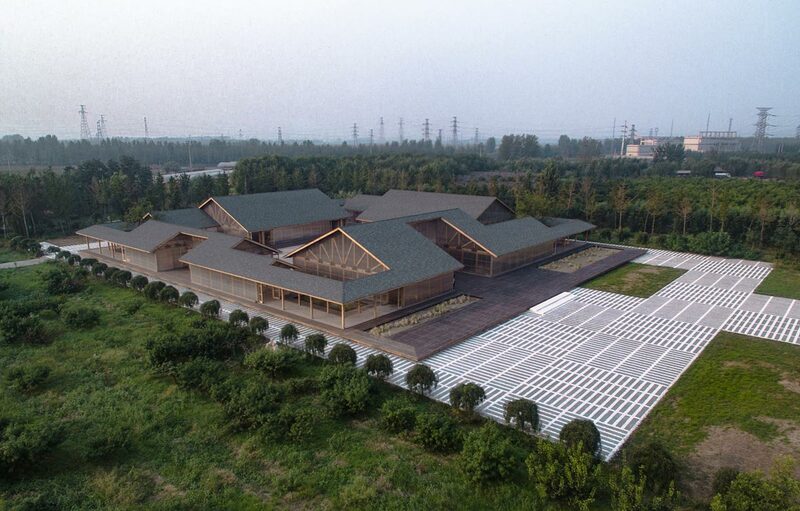 The self-contained compound is at the same time able to harmoniously coexist with the surrounding natural environment. 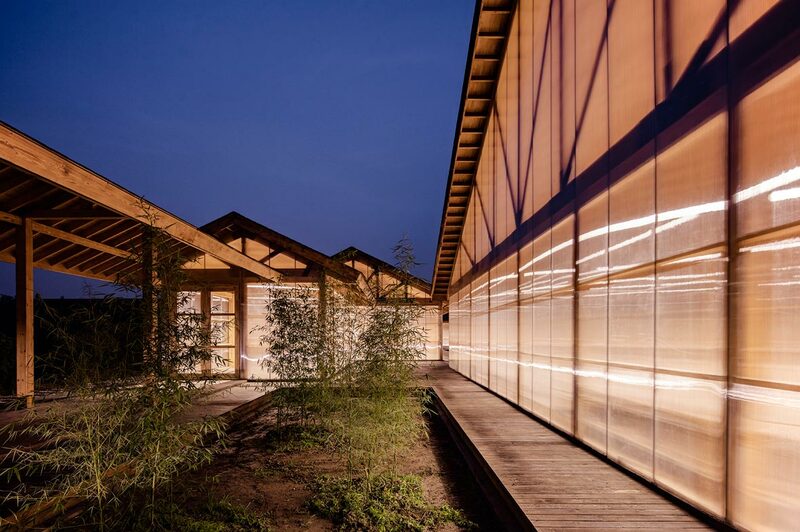 The entire compound is split into four enclosed, relatively independent buildings: a material storage, a mill, an oil pressing workshop, and a packing area. The inner courtyard is the grain-sunning ground, and a convenient work cycle line is formed around the inner courtyard. The exterior of the buildings are corridors that connect the four areas and leads to the food processing workshop. 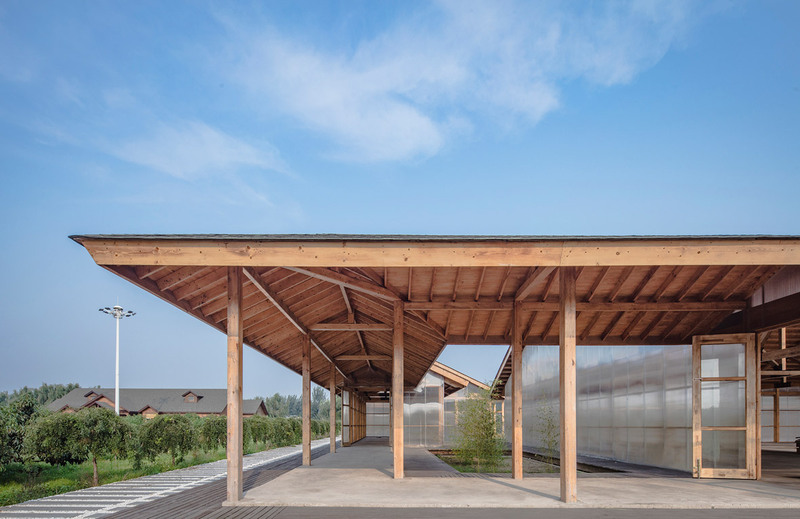 The central courtyard spans out around the Organic Farm unintentionally, forming a multilayered area that fulfills the need for natural ventilation, natural lighting and views of a workshop. 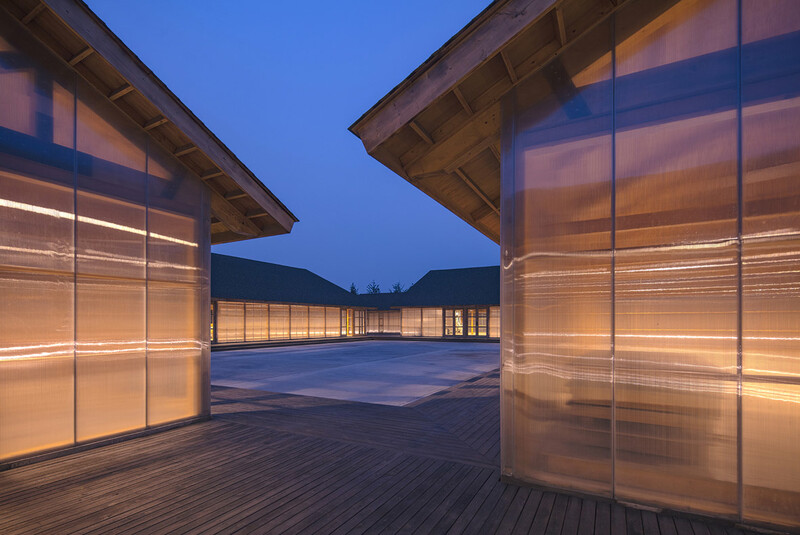 The organic relationship between the courtyard and each building creates functional areas of various sizes: small corridors, medium-sized rooms, and large workshop are all able to fit under one big roof, allowing for even more flexibility while meeting the functional needs of the building. 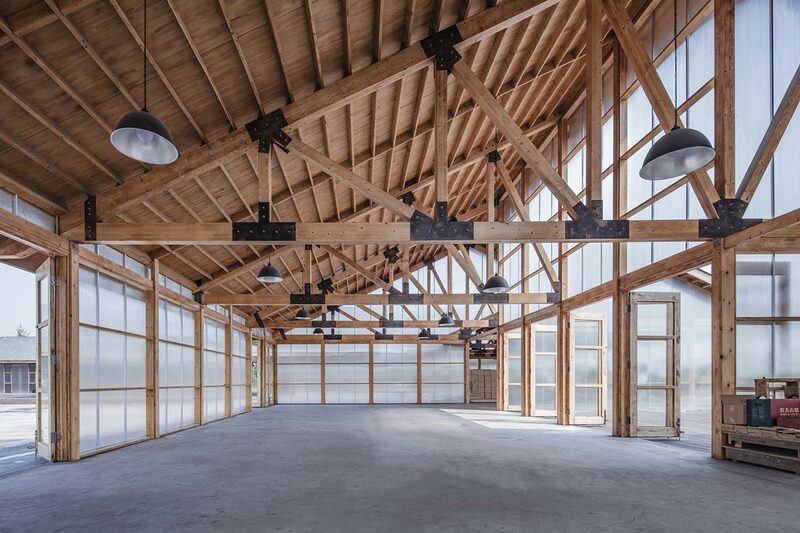 Lightweight, easily processed, and easily installed, wood was the main material of choice. 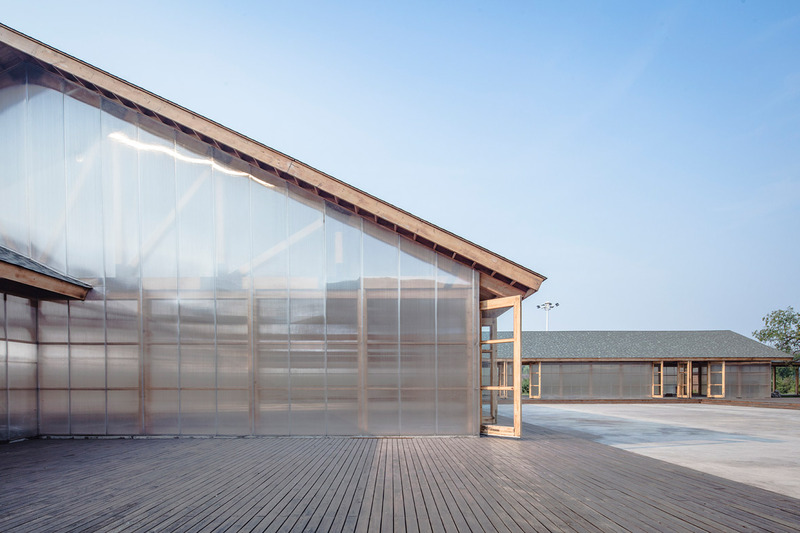 Because it sits on a 60cm cement base, the building appears to floating above the ground due to the 60 centimeter cement base that it sits on, which also allows the wooden structure to be moisture proof. At the same time, this design choice hides pipelines and various fixed equipment, allowing for a cleaner visual presentation to visitors. 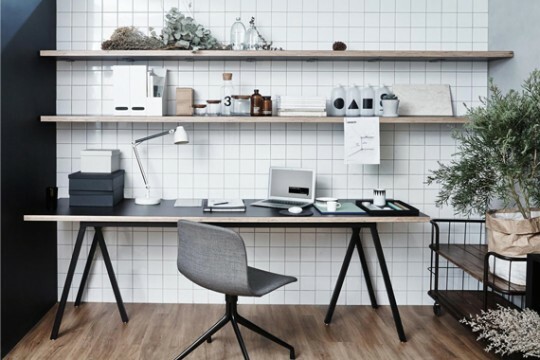 The thoughtful designs employed by Arch Studio, such as the material choice and structural shape, all flawlessly work together and has resulted in a warm, natural, and comfortable working atmosphere. Gurgaon-based visual artist Pragya Bhargava believes that nature is intrinsically linked with culture, and that these are two major components which have shaped our society and way of life. Through observing the natural elements that impose their influence on landscapes over time, she endeavors to explore the vital connection between the connection between the two, a connection that has become largely overlooked and ignored. 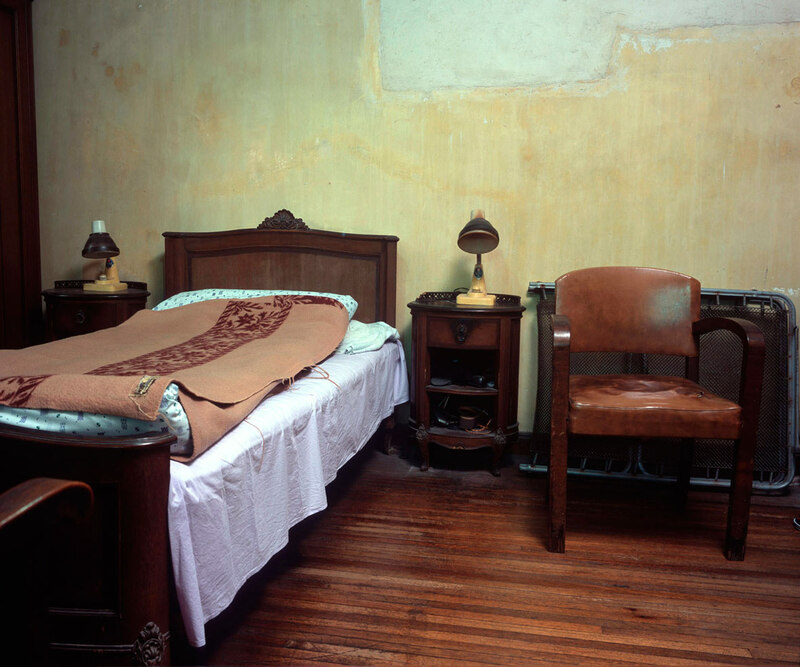 In attempting to fully visualize and present this vital connection to her audience, her art often blurs the boundaries between photography, printmaking, and drawing. 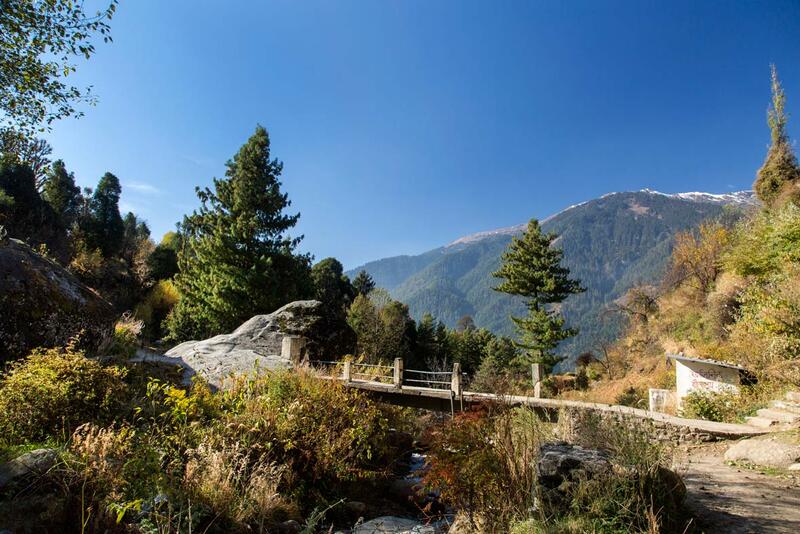 Recently, we talked to Pragya about her work and some of the underlying themes behind it. Neocha: How has living in India influenced you as a photographer? 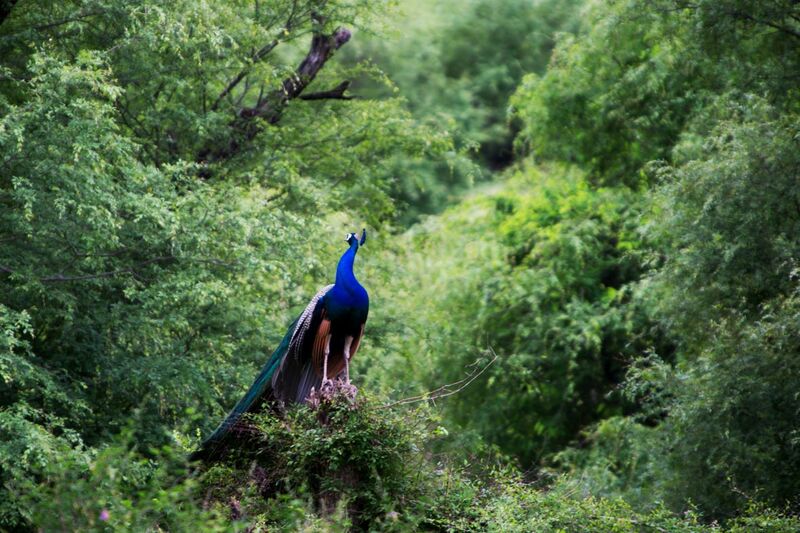 Pragya Bhargava: Being based in India has had a significant impact on me as a photographer. 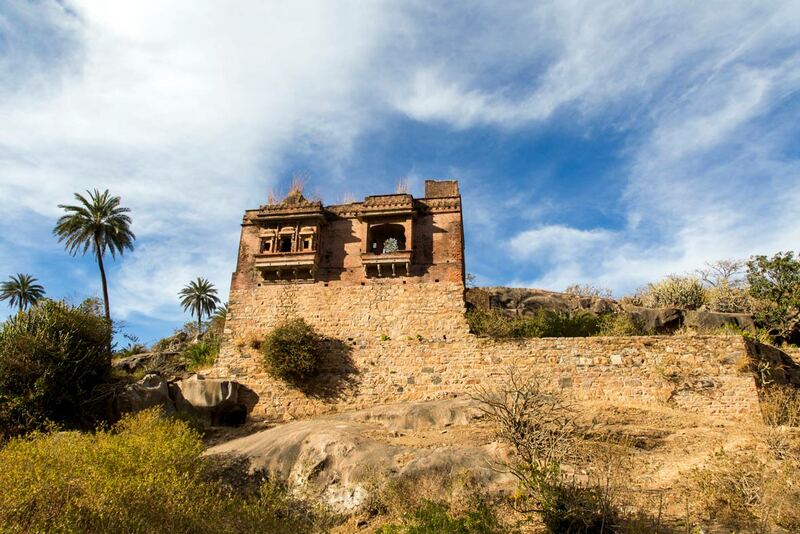 The diversity in landscape and the richness of history and culture prevalent in Indian society is an anchor for my photographic practice. 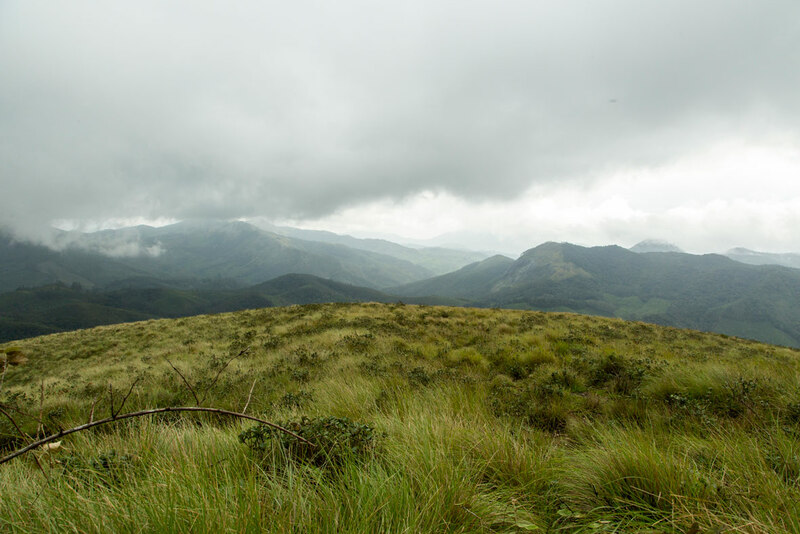 With the knowledge that human history has been written several times over on the same piece of seemingly uncluttered land, the resolved nature and settled wisdom of the land around me grounds my practice and leaves me in awe. Neocha: How long have you been doing photography and how would you describe your photographic style? Pragya Bhargava: I have been practicing photography for eight years now. But to define or describe a photographic style, I feel, requires many more years of experience and practice. At this point, I find my photographic style to be based largely on intuition. Photography is essentially drawing with light, and every subject demands a certain kind of light, in order for it be presented for what it looks and feels like. I shoot mostly on a 5D Mark III and prefer working with natural light. For the process of shooting, I follow my instinct to shoot the experience of my subject. Although I usually tend to keep distance between the camera and my subject, there is always a sense of comfort in the frame. For the outcome, it is absolutely essential that I be satisfied with the work before I present it to an audience. 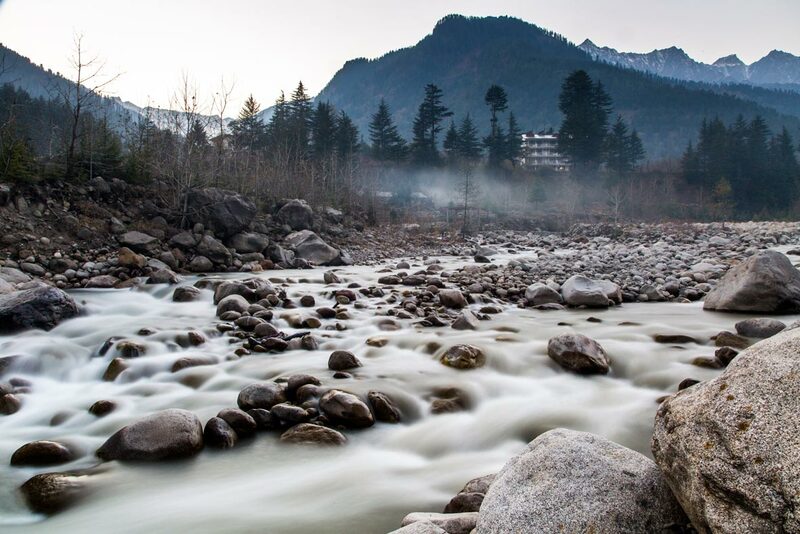 Neocha: Where is your favourite place in India for shooting landscape photography, and why? Pragya Bhargava: I like being on the road. 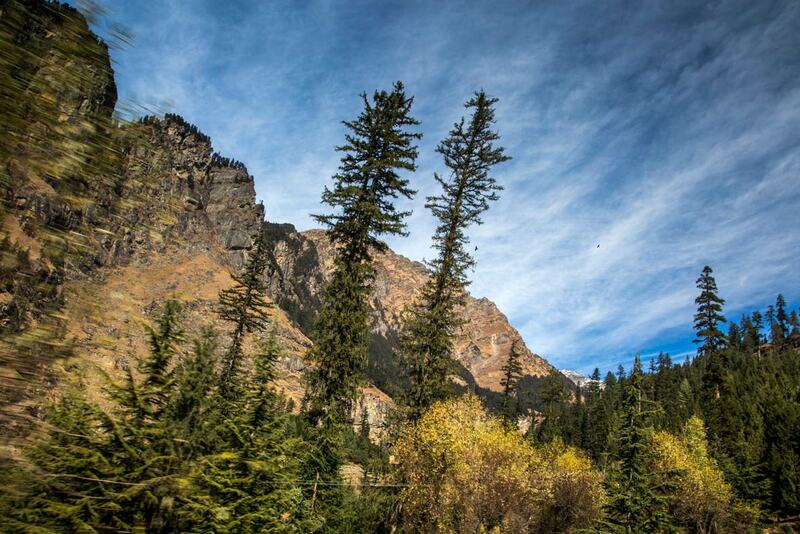 The landscapes you encounter on road trips can hardly ever be listed on a map or bound in a book. 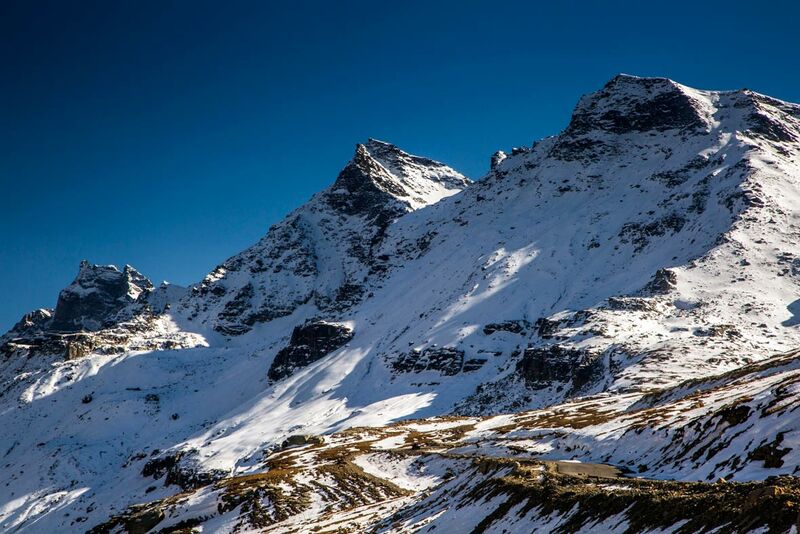 This is why I rarely plan my destinations or make advance bookings when I’m out shooting landscapes. I decide the terrain I want to shoot and set out in that general direction. Most of my traveling is by road and the landscapes punctuate my travel. Sometimes I gaze, other times I halt, but it’s not every time that I shoot. Neocha: Are there any challenges you face when shooting landscape photographs, and what are they? Pragya Bhargava: Recreating experience is an important part of my practice. Therefore, the biggest challenge for me with landscape photography is being able to do justice to the experience of landscapes. Visually, I may be able to portray what I see but the challenge lies in capturing the timelessness and ephemerality of landscapes while maintaining their tangibility, omnipresence and incorporating their multifaceted character, due to the years of layering and transformations landscapes have undergone, in a single frame. Neocha: How far do you go in post-production? How important is post-processing in making a landscape photograph? 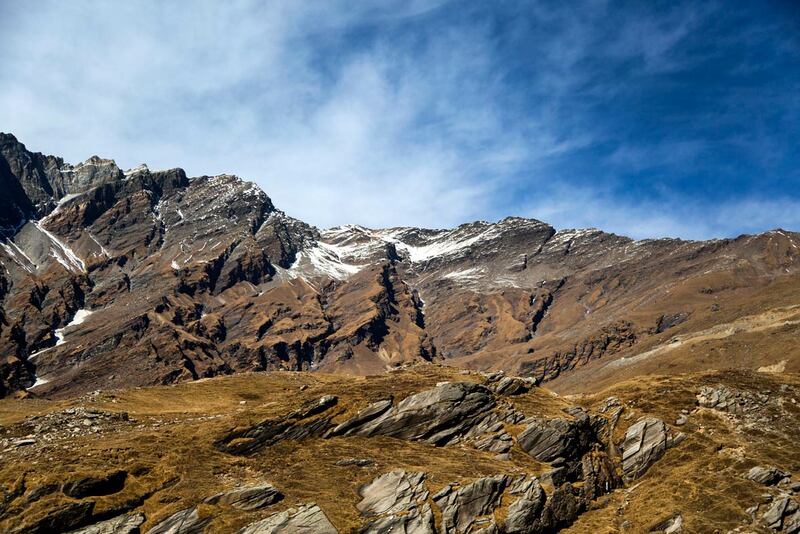 Pragya Bhargava: The landscapes define how far I go in post-production. With the aim to reproduce an experience and recreate an atmosphere, I use every tool at my disposal to get there. But there’s a fine line in processing that lies between under and over processing and I need to be on it. My process usually involves shadow recovery, highlight and contrast adjustments, levels and colour balance, preserving details in the extreme points, mostly during raw conversion itself. 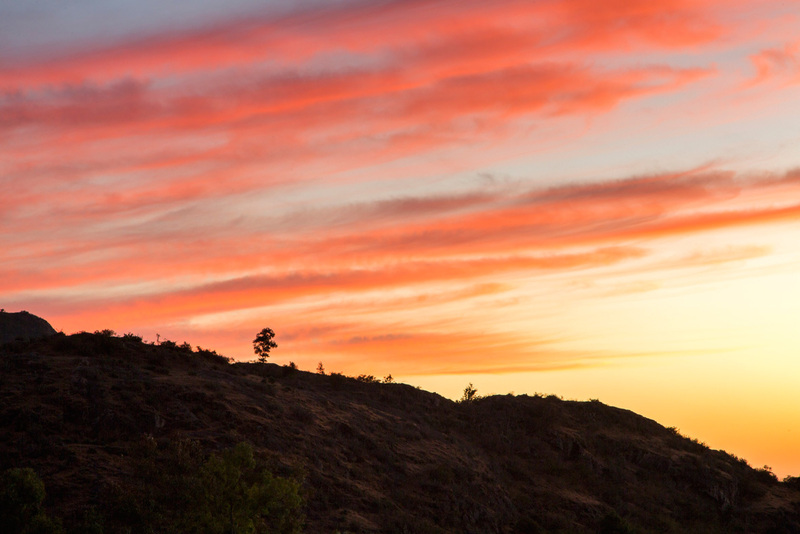 A raw image file is only half baked, processing and post-processing completes the process. 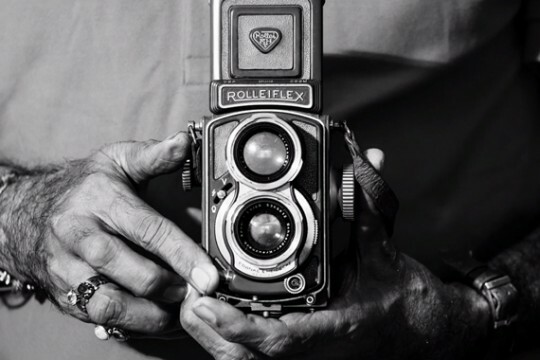 They are tools, like the camera itself to translate ideas into finished products. Each of them have an equally important role to play. 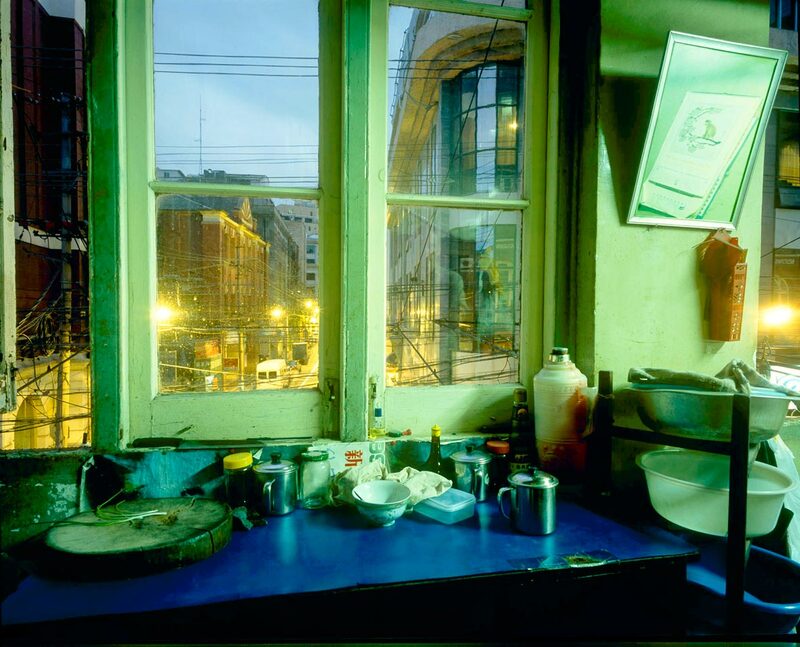 Neocha: Who do you count among your biggest influences, photographically or otherwise? Pragya Bhargava: The photographs of Ansel Adams and Cory Richards and the paintings of J.M.W. Turner have been huge inspirations for me, but Leonardo da Vinci has been the most significant influence in my life, especially professionally. Da Vinci was a polymath. To a layman who wants to understand him and his work, his ideas might seem all over the place, yet it was cohesive in his mind. In my journey as a student of science, I have a Bachelors in Fine Arts and a diploma in dance. I’m currently studying physics in order to learn more about geophysics to gain a better understanding of landscape dynamics to enrich my practice as an artist. I look up to Da Vinci and take inspiration from him and the thoughts he left behind in his works. Neocha: Do you have guiding principles that you follow when you’re making pictures? Is there an underlying philosophy that binds all your work together? Pragya Bhargava: It’s more of a routine now. I do my ground research, assess the situation, make myself comfortable with the situation and with the subject so they don’t feel like an outsider. I look at the light, the subject, my equipment, and consider my aim but stay flexible. I prepare for my shot and follow my routine to capture what I intended to shoot, but as a photographer, I’m not stubborn about the shooting. I’m prepared for the unplanned and to let go if chance offers an alternate opportunity. For me, instinct has always been a better guide than planning. What probably binds my work together is that no matter what I’m shooting, I try to remain true to my subject. I try to understand my subject first, taking its various facets into consideration, and try to present it with all its intricacies. Neocha: You’ve also created conceptual works like Ode to the Landscape and The Yellow Brick Road, which still contain a strong focus on landscape. 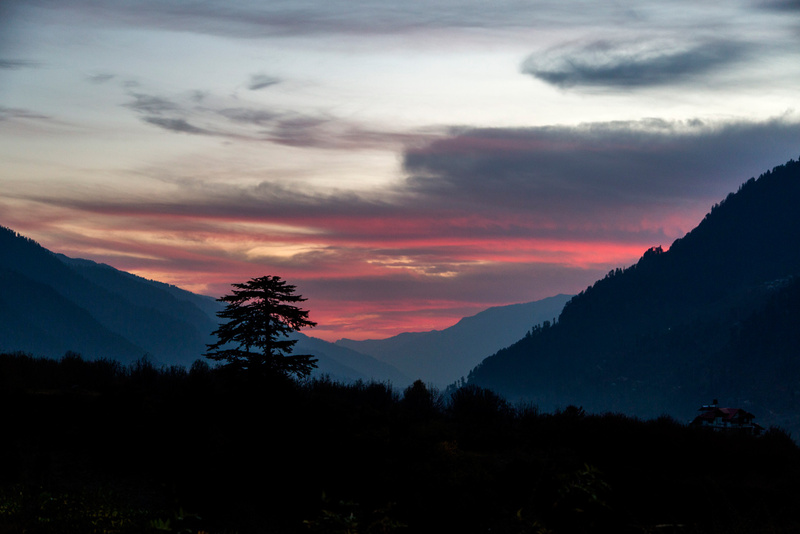 What is the allure of landscapes for you? Pragya Bhargava: Every artist needs a muse and mine happens to be landscapes. 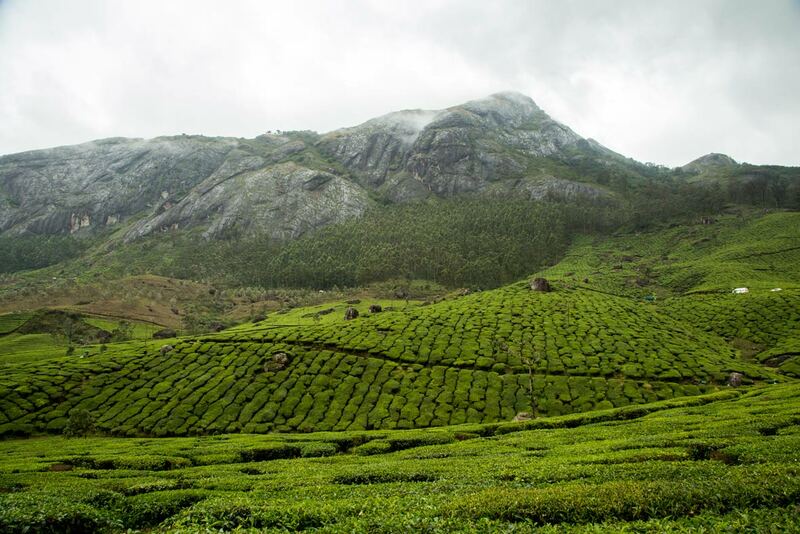 The enigmatic character, constant change and ubiquitous grandeur of landscapes is what attracts me to them. For me, they are like people but infinitely more complex. I have an unfaltering need to understand their personality, history and character. Sometimes these landscapes seem to talk directly to me as a sensory experience or feelings they evoke, while other times I feel the urge to read into things that are left unsaid, thinking in terms of the stories that might have been. 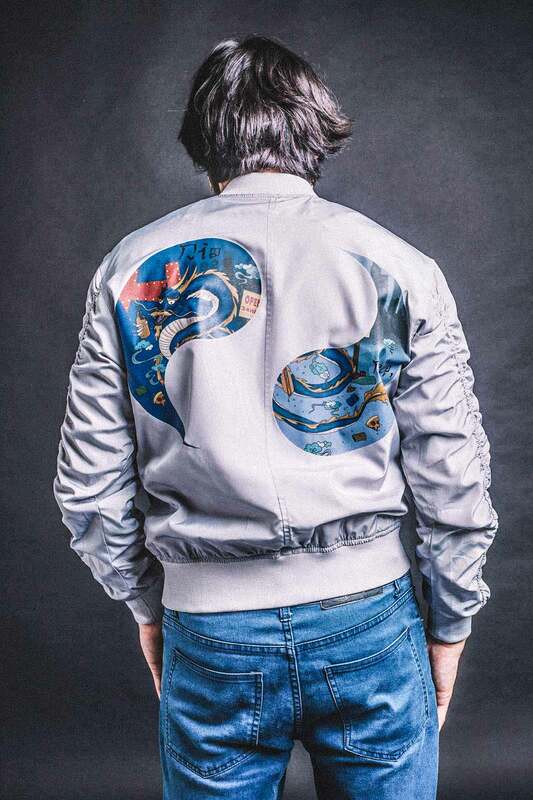 Dig Deep is an independent menswear label based in Singapore, their apparel is designed in and inspired by the East Asian region. Each collection focuses on a particular country within the region and aspires to convey certain elements of each country’s culture. 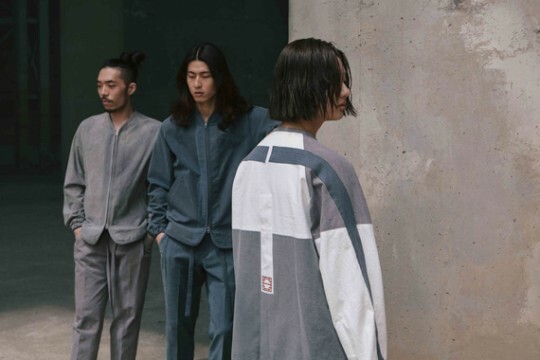 Dig Deep juxtaposes traditional elements with the most rugged aspects of their respective countries to create premium garments for curious-minded people living in this homogeneous generation. 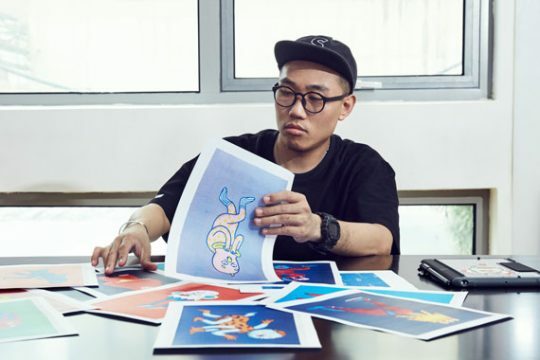 Recently, Neocha sat down and talked to Choo, one of the founder of Dig Deep, to find out more about their inspirations and view on streetwear culture in the region. Neocha: Within the context of Singapore, have you faced any difficulties in trying to start an independent fashion label? What are some of the more memorable experiences of starting this label? Choo: We’ve actually encountered countless issues along the way due to nature of the fashion industry in Singapore. The difficulty of sourcing embellishments and fabrics was definitely one of the most challenging one we’ve had to overcome. By many measures, the local fashion industry is quite small when compared to other industries in Singapore’s economy. This led us to the sourcing of our fabrics and embellishments from more established markets in Japan, China and Vietnam. One of the most interesting things we did in starting Dig Deep, and still continue to do this day, is work closely with our pattern makers. Both ladies of whom are in their late fifties and have been perfecting this art for over the past thirty years. Pattern making is essentially a dying trade in Singapore, a skill that many can pick up with time but only able to master through countless years of experience and practice. Pattern making can be loosely defined as making the shapes for each component (e.g. sleeve, cuff, collar, bodice etc. for a shirt) of a particular type of garment and these shapes will eventually be used to cut the fabric according to the patterns before being sewn together. 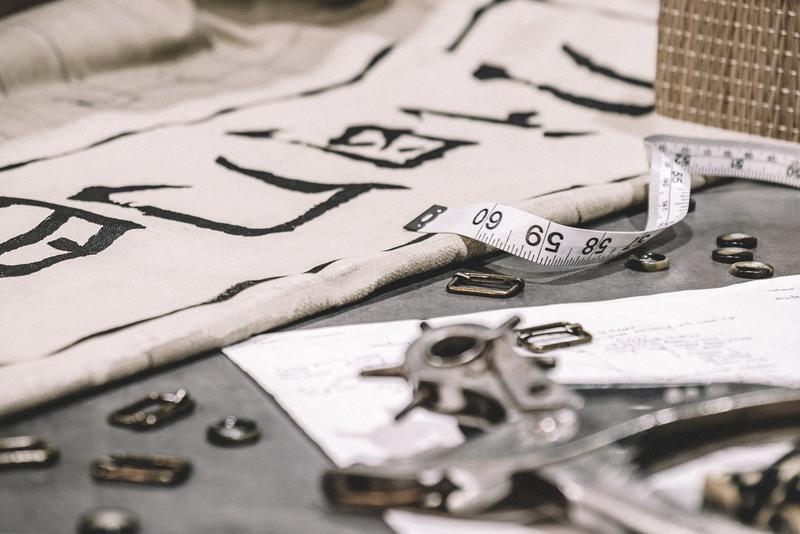 The pattern makers we work with exercise a great degree of judgement and precision in crafting the patterns according to our sketches, measurements, and inputs through fitting sessions. We actually rely heavily on these increasingly rare artisans to bring Dig Deep’s designs to life. Neocha: Many would agree that Singapore is the financial center of South East Asia, and you come from a financial business background. In a country where it’s possible to have a comfortable career in finance, what led you to abandon this path and dedicate yourself to fashion? 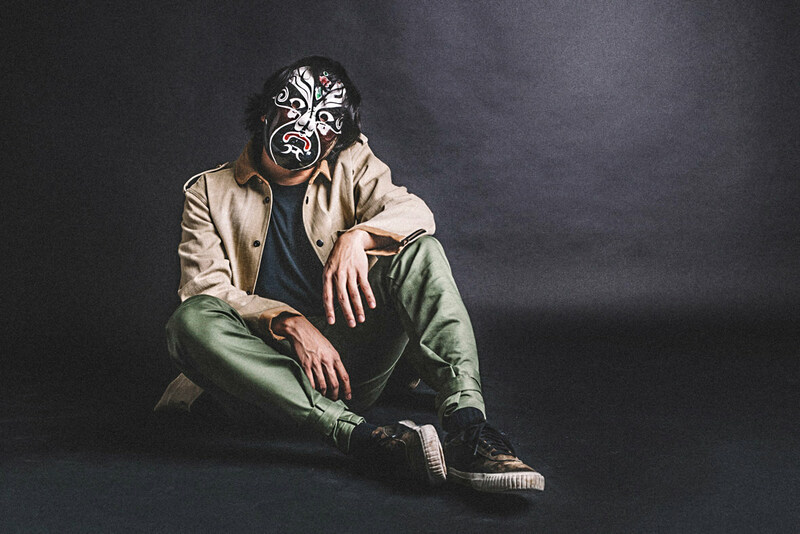 Choo: I would say there weren’t any factors that pushed me to leave the world of finance, but rather I was pulled and drawn into the world of fashion by a number of factors; one of which was definitely the insatiable desire to create. I saw the creation of garments and Dig Deep as an avenue that would allow myself and my team to create a brand and products that hopefully many would be able to relate to. In fashion, the individuality beyond just the garments itself was also something that truly intrigued me. I have always found it very interesting how the same piece of garment could be part of such a disparate impression for two different people wearing it. The styling, the attitude, the age of the individual, their gender, their body structure, their tattoos or the lack thereof are all components that actually give the garments its character. To me, It’s really fascinating how people buy clothes with the mindset that it creates a certain persona or impression of themselves to others, or even to themselves. They’re generally unaware that their interaction with the garment itself is actually what gives the garment its character. Neocha: Most Asian countries have westernized rapidly in the last few decades, and it’s kind of xenophilic on some levels. When you created Dig Deep, did you feel a certain sense of responsibility to make certain cultural and traditional aspects of Asia more accessible to the younger generation? Choo: Most definitely. There are a number of reasons why we feel this way. One of the main reasons is this perspective that we all hold in the team, which is without knowledge of history, and the cultural, traditional aspects of different parts of Asia, we would not be able to appreciate the present to the fullest extent. It’s only by learning about the journey of how Asia has come to be where it is right now that one is able to understand where the future of Asia lies. 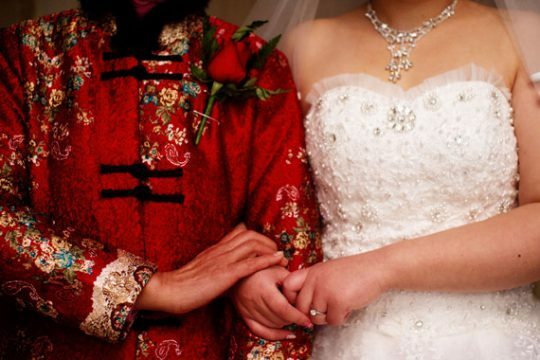 The result of the rapid westernization of the East has most definitely brought about some benefits for Asia, but not without its disadvantages, such as the erosion of our own culture, tradition and aesthetics. These things have to be relearned due to the younger generation’s lack of exposure to these elements. The result of which is often an aversion to these seemingly archaic elements, often seen as being outdated and irrelevant to the current generation. 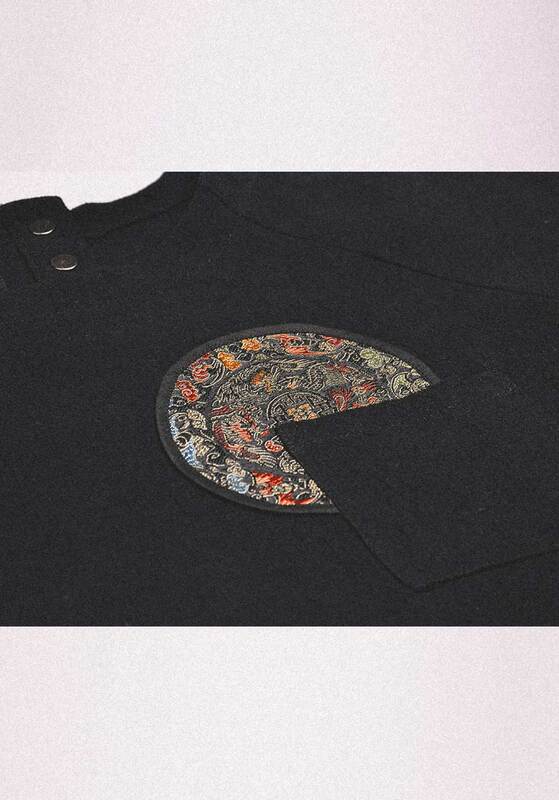 What we aim to achieve here at Dig Deep is to generate curiosity and create designs for garments that we feel would be highly relevant to this generation and also serve as a catalyst for one to explore deeper into East Asia’s immensely rich heritage. Neocha: How did all the minds behind Dig Deep meet and get together to start the brand? 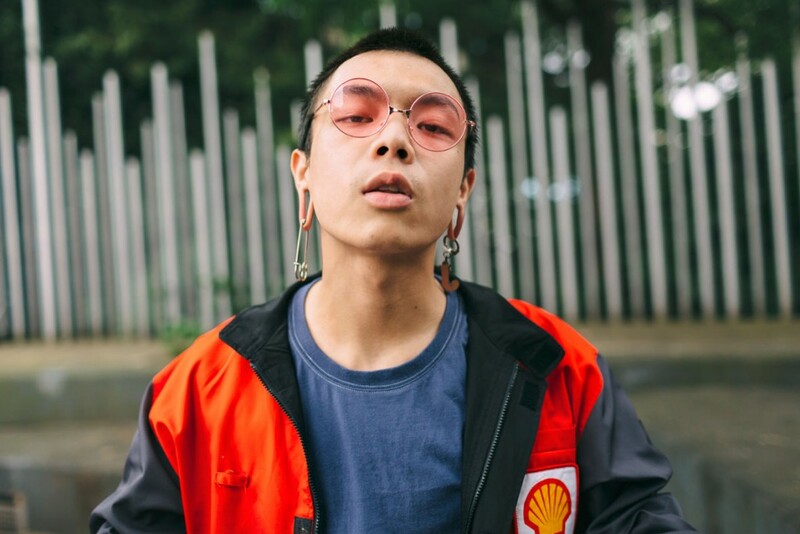 Choo: A good friend of mine and I were actually having a conversation, about a year and half back, talking about how we felt that much of what we wore in both formal and casual settings was predominantly, or in most cases, entirely Western by nature. We then went on to speak about how wearing our traditional outfits was essentially left for rare occasions and we imagined how people would react if we wore it on a day-by-day basis; we envisioned most people might find it quite odd, and we’d most likely be ridiculed by some, which really got us thinking why that was the case. It became quite clear to us that the economic and political dominance of the West over the last few centuries have permanently altered our perception of our own culture, traditions, and arts, to the point that most of us have developed a sense of aesthetics or normalcy in dressing in a style that’s aligned with Western cultures. We felt that the underappreciation of the arts and culture in the Asian region was less a result of inferiority and more related to an underexposure of Asian elements. 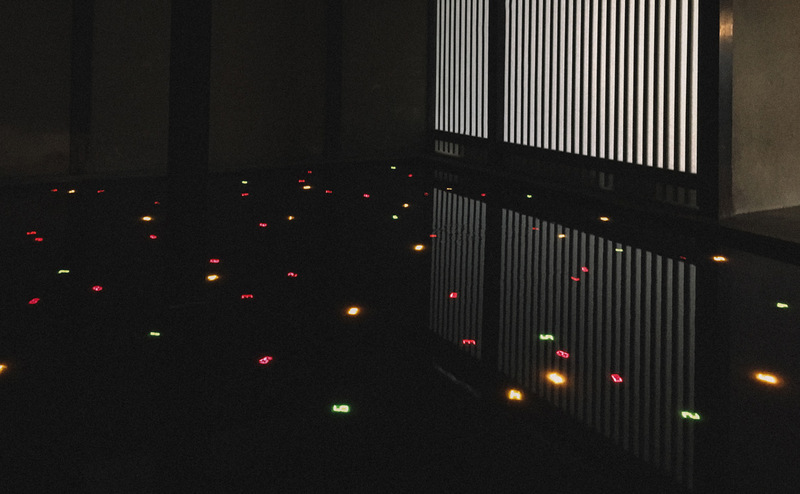 Thus, in order for Eastern aesthetics to be considered “normal” and “pleasing to the eye,” it needs more exposure. It was through this conversation that Dig Deep was manifested. We noticed the absence of an Asian-inspired high street brand in the global fashion scene and felt strongly there was definitely room for a number of Asia-inspired brands such as visvim and the up-and-rising IISE to appeal to the global audience, in what has become a rather homogenous environment for high street fashion. It is our hope that Dig Deep, along with other Asia-inspired labels, will be able to bring about a refreshing perspective on high street fashion. Neocha: You guys insist on all-original designs, and there are many interesting details in each single one of your creations. What are some reoccurring concepts you try to incorporate when designing an outfit? 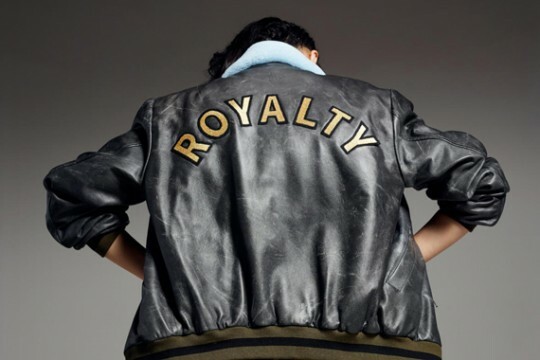 Choo: One of the concepts we constantly explore from collection to collection is the reinterpretation of certain iconic traditional elements and how we are able to respectfully transform and incorporate these elements into a particular garment, but in a unique and refreshing way. For example, our first official collection Dragon in the Concrete Jungle explored one of the legends of the East, the late Bruce Lee. We were particularly fascinated with Bruce Lee’s final film appearance before his passing, the 1973 classic Enter the Dragon. In that film, Bruce Lee can be seen wearing a particular type of pants in several iconic scenes. 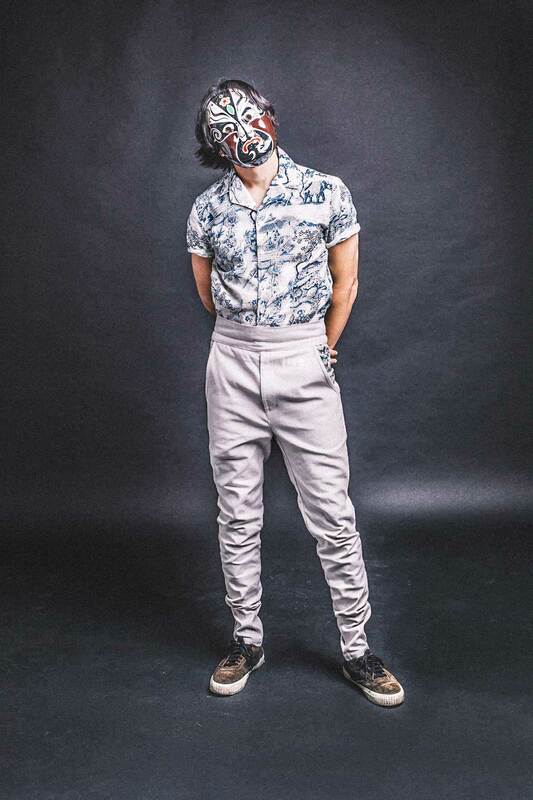 We saw the incredible structure and silhouette of the pants, which was extremely flattering to the male body; being slim at the waist, with strength around the thigh areas, before it’s tapered down near the ankle region, allowing it to elongates the legs. We adopted a very similar structure to our pants and not only that, the cloth used in securing the ankle regions as seen in the film was reimagined. 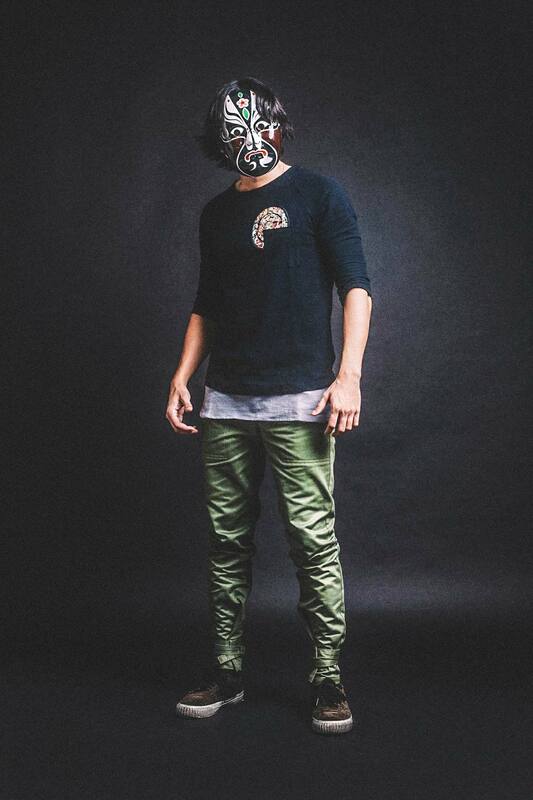 What we created was essentially Bruce Lee’s pants. In the early design phase, we will also try to understand the functionality and reasoning behind why a particular traditional East Asian attire is the way it is, the reasons behind how the aesthetics of that attire has come to be. In our upcoming collection based around Japan, we researched extensively on a couple of facets of Japanese culture, one of them being the attire worn in the art of yabusame, a type of mounted archery in traditional Japanese culture that originated in the Kamakura period. 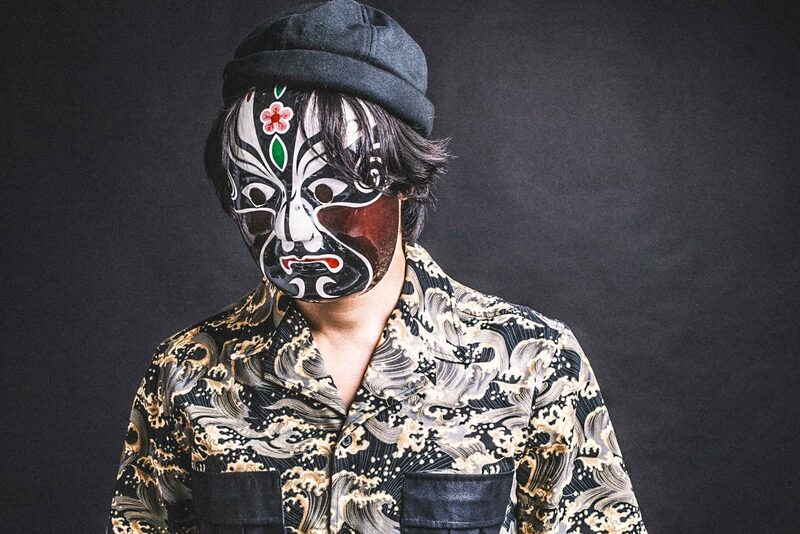 Neocha: Many brands are starting to create more Asia-inspired apparel, and most of them keep it rather traditional, what would you say makes Dig Deep different from the rest? Choo: There are a number of factors which set Dig Deep apart from the rest and chief amongst these is in our view, our perspective on East Asia which stems from the dynamic nature of our team. The heritage and influences of our team is quite wide ranging. On our team, we have Chinese individuals who have grown up in westernized societies, such as Melbourne and Singapore; a Eurasian whose heritage is part Polish and part Chinese, but whose nationality is American; and also a Shanghai native who has spent a large amount of time in Singapore. This diverse dynamism within the team allows for Dig Deep to have a highly varied and nuanced view of East Asia and affects how we interpret different elements of East Asia. This has a direct impact on the brand and all of our designs. Our individual opinions and perspectives are forced to interact collectively and the result of which are designs that stand apart. 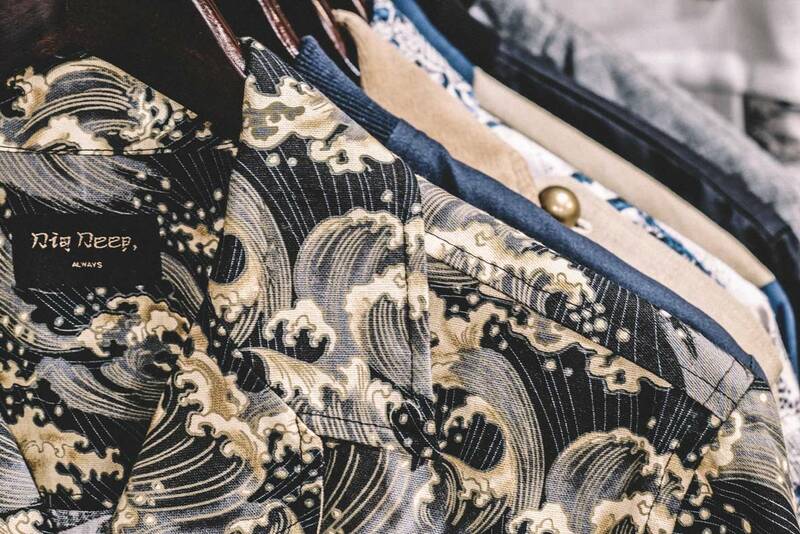 On the more tangible side of things, we place a lot of emphasis on the quality of our fabrics and embellishments along with the workmanship behind putting each garment together. 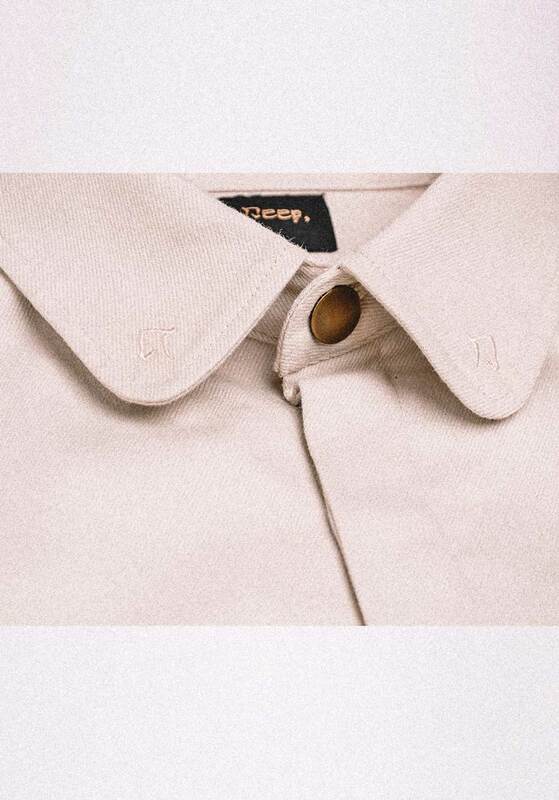 We never compromise on the smallest of details for each garment. Every piece of garment is handmade, which allows us certain types of finishes and quality that would not be possible with machines. 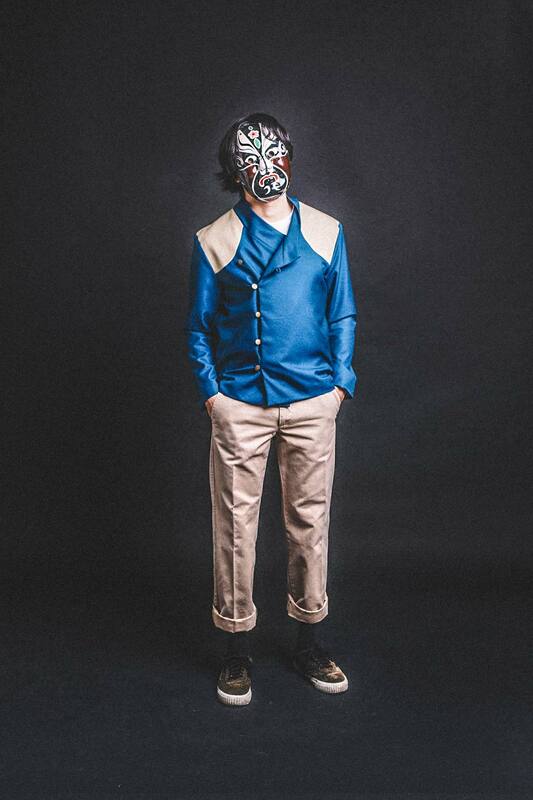 Neocha: Traditional East Asian attires have a very unique look compared with traditional attire in other regions. 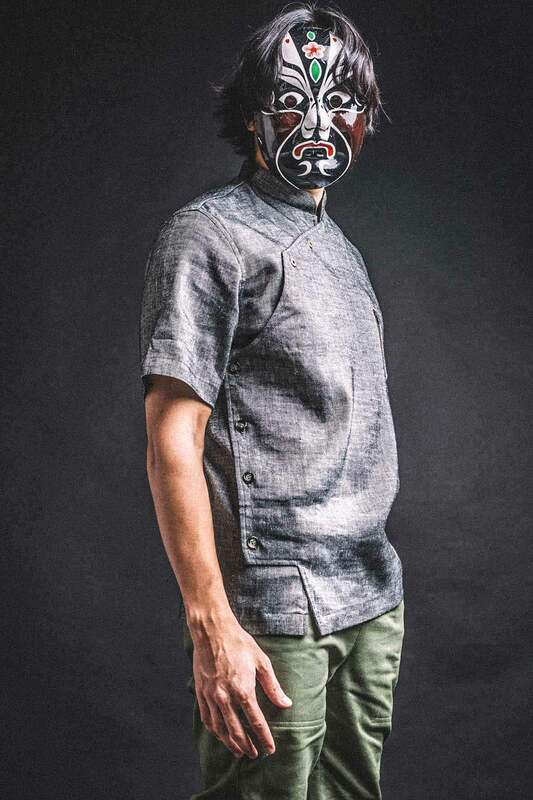 What is your take on the aesthetics of traditional East Asian attire? Choo: One of the major differences for traditional East Asian attire compared with traditional attire of other regions would most definitely be the evidence of strong hierarchal elements in traditional East Asian attire. It’s not to say that these elements aren’t present in the traditional attire of other regions, but the difference is really in how the hierarchal elements are expressed. In traditional East Asian attire, the aesthetics for royalty and higher ranking members of society revolved around mythological creatures, in addition to rich colours and embellishments. 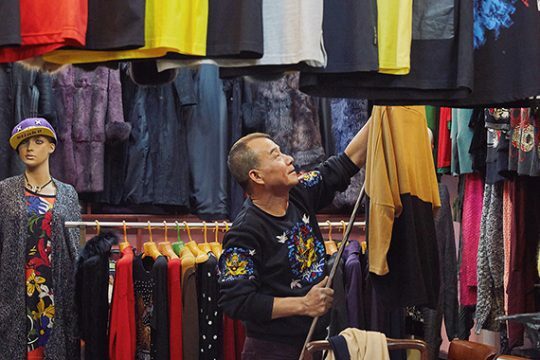 The unique look of traditional attire in East Asia can also be attributed partly to the environmental conditions of the region where seasons play a large role in what people used to wear to protect themselves against the environment. 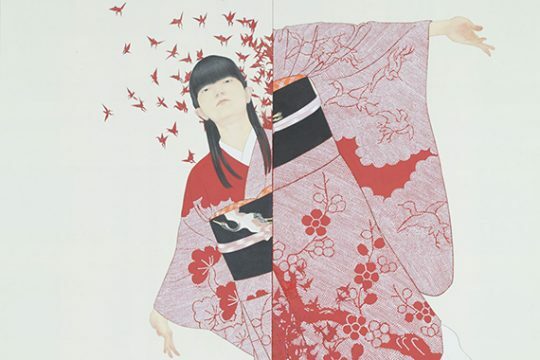 The iconic layering often seen in East Asian attire was mostly due the harsh winters in certain areas of East Asia and though it served a functional purpose, it has also become one of the more prominent features of East Asian aesthetics in the traditional garments. However, we are very often very cautious in generalising traditional East Asian attire under one category, as the differences from country to country, even within a country itself from region to region, or the different time periods have spawned numerous looks within East Asia. 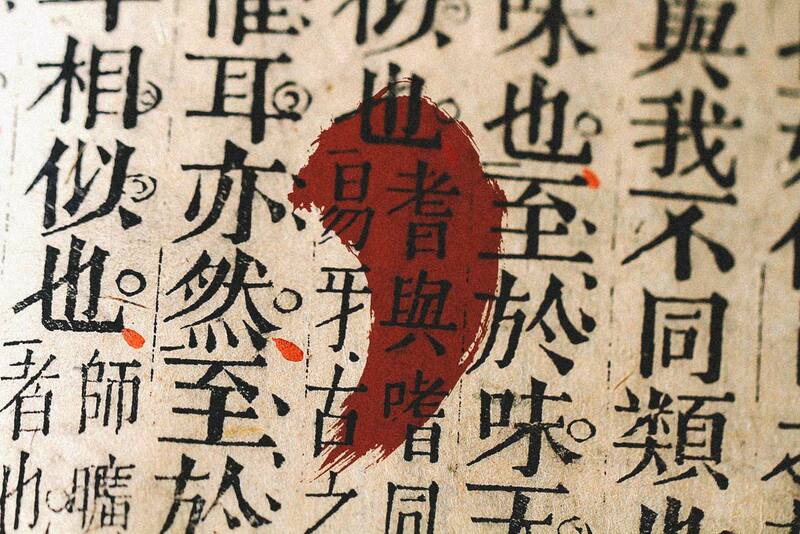 It is this dynamism within the East Asia region that we at Dig Deep, truly revel in. 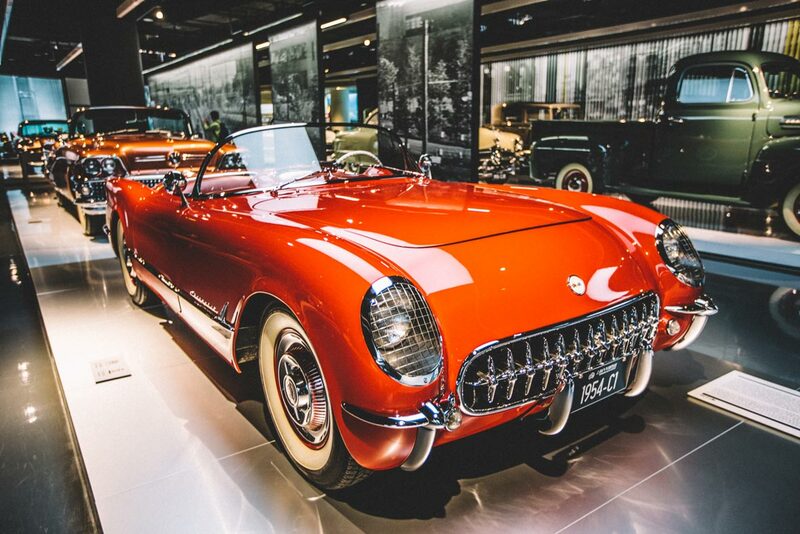 As an enthusiastic car lover and a collector of Hot Wheels, I have longed to visit the Shanghai Auto Museum for a while. 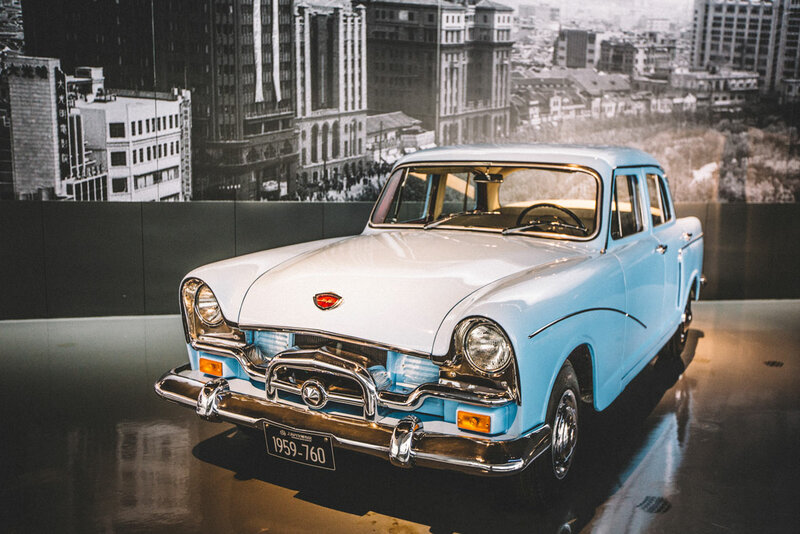 Following the hype of the recent 2016 antique car rally, Moving Legends, I made the pilgrimage to the holy land for Chinese car collectors – the Shanghai Auto Museum. 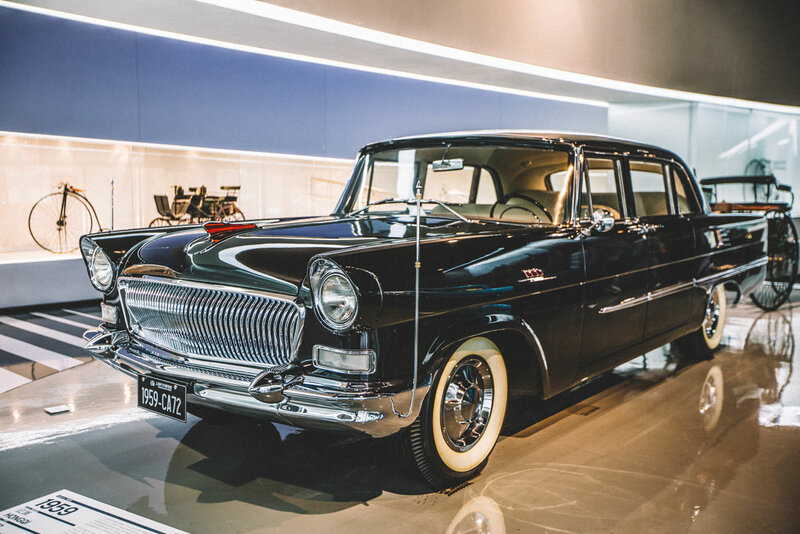 Located in Anting, an hour’s drive away from Shanghai’s downtown area, the museum is China’s first dedicated auto museum. It was co-designed by the Architectural Design & the Research Institute of Tongji University and IFB from Germany and officially opened to the public in 2007. 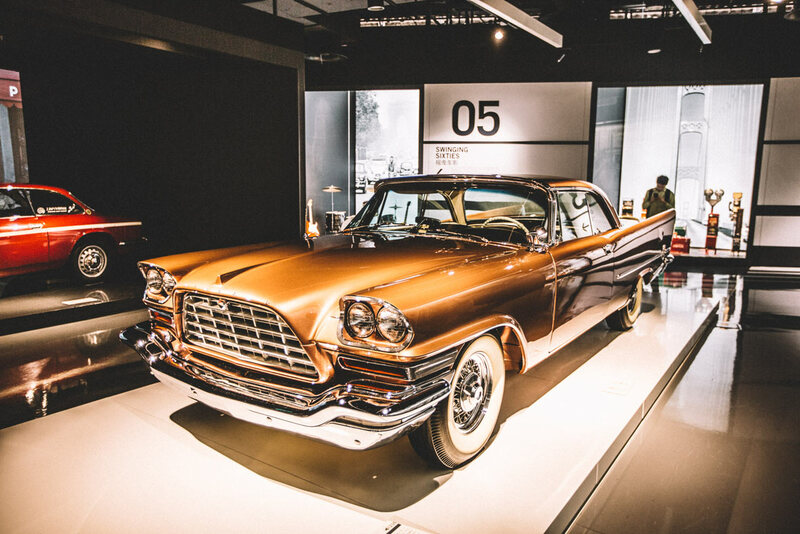 I’ve been to most of the car museums in China and compared to the Changchun International Automotive Museum and Beijing Automobile Museum, the Shanghai Auto Museum was much more diverse and much more interesting. 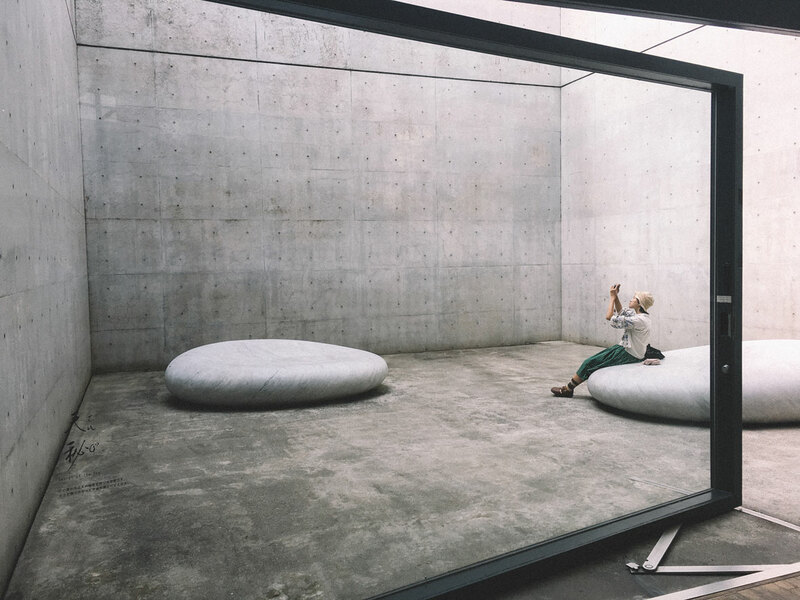 Many museums in China actually have this problem, where they might look spectacular from the outside, but once visitors are inside they will disappointingly discover a lack of noteworthy content. 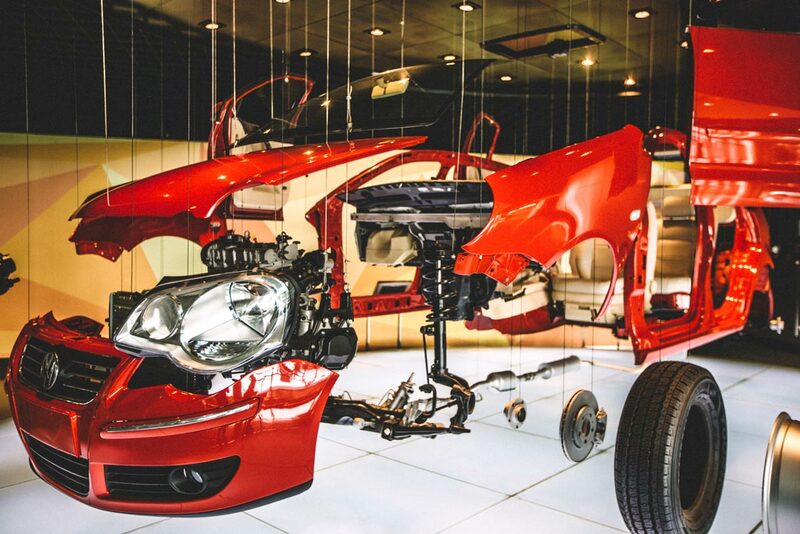 Being government owned, the Shanghai Auto Museum has outdone itself in so many ways. 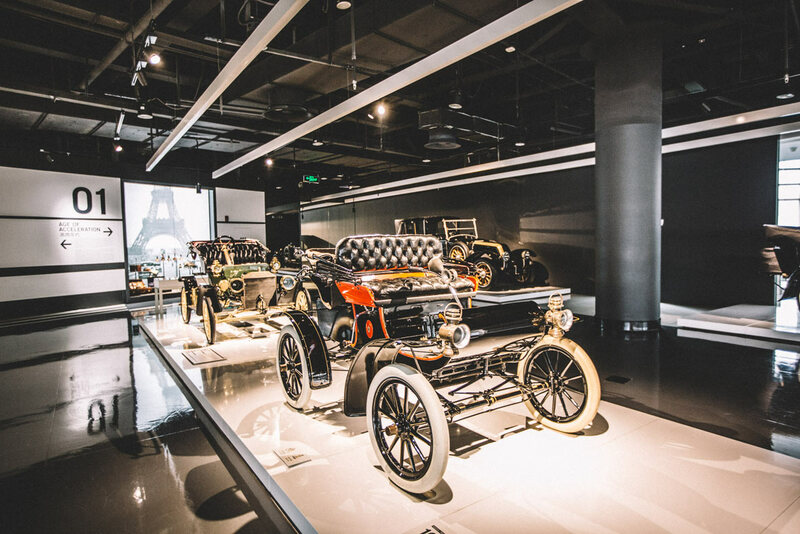 Being able to see the 1886 Benz Patent Motor Wagon, 1935 Rolls-Royce Phantom 2, and the Hongqi CA-72, which was used during the Chinese national day parade in 1959, all on display in one place made for an amazing experience. 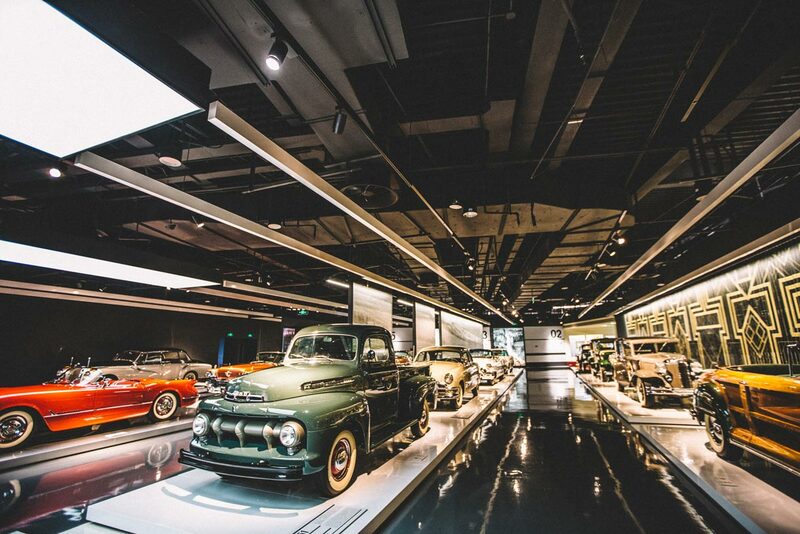 The museum is divided into three pavilions: the History Pavilion, Antique Car Pavilion, and Exploration Pavilion, with a majority of the most interesting vehicles exhibited in the first two pavilions. The ticket costs 60 yuan and the museum has both Mandarin and English-speaking guides available. 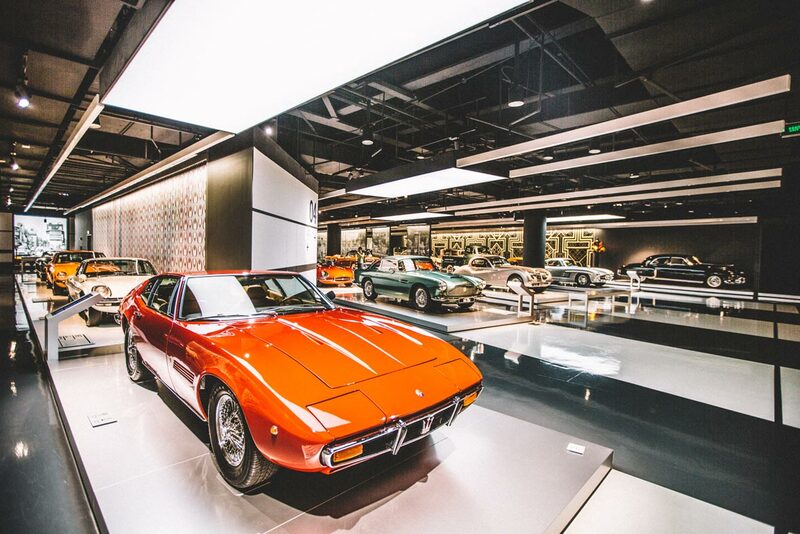 The first area is the History Pavilion, a space that houses a total of 27 cars, all of which represent milestones in automotive development. The guide told me the museum is continuously updating their collection, and by the next time I visit, there might be new additions to their collection. 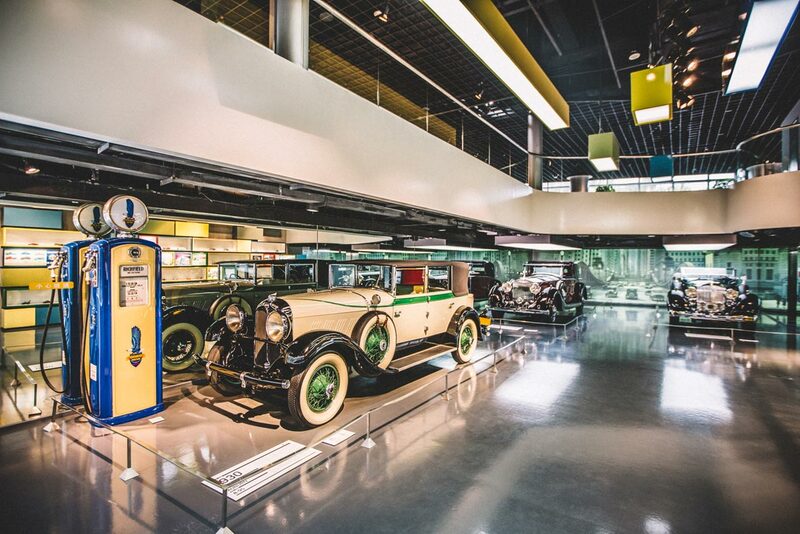 If you don’t know much about automotive history, this area offers a great learning opportunity. 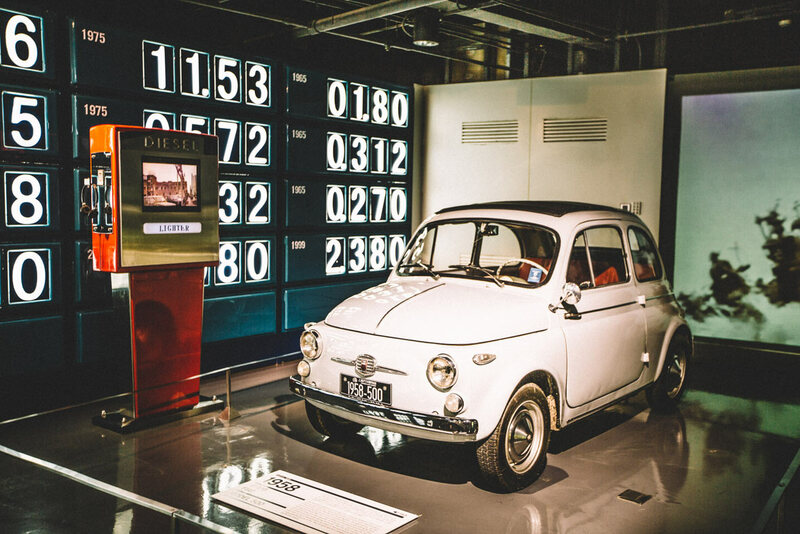 Besides the collection of rare vehicles, there are other points of interest in the History Pavilion, such as a wall that displays the changing gas prices over the last few decades and the speed records of some most famous racetracks around the world. 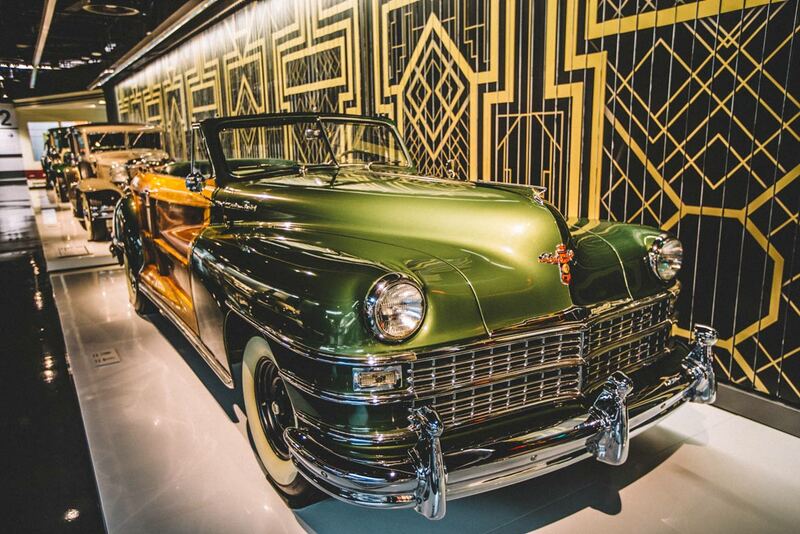 The Antique Car Pavilion houses the most amazing vintage car and model car collection in China. 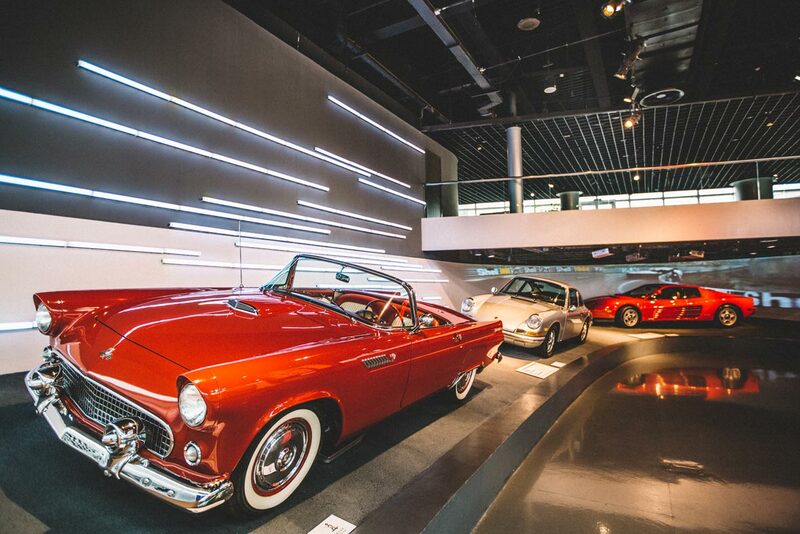 In this area, visitors can browse more than 200 model cars in different scales, with a majority of them made by the famous German model car manufacturer CMC. The main section has 40 cars from 20 different manufacturers dated between 1900 and 1970. 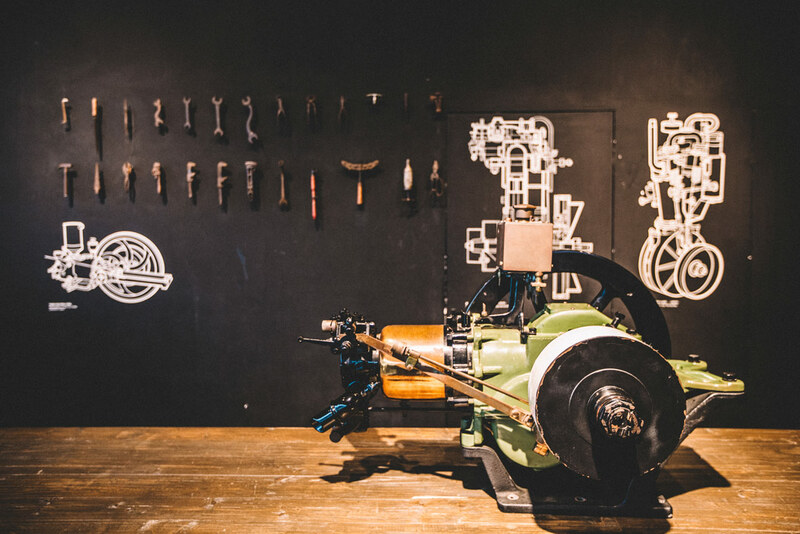 Iconic Chinese two-wheelers are also on display in this area, such as the Phoenix 28 bicycles, Xingfu 250, as well as the Yangtze and Donghai 750 motorcycles; all of them are of course kept in pristine condition. If you are a fan of American cars, you can spot the 1970 Pontiac GTO, 1957 Chrysler 300C, 1954 Chevrolet Corvette, and 1964 Ford Mustang. 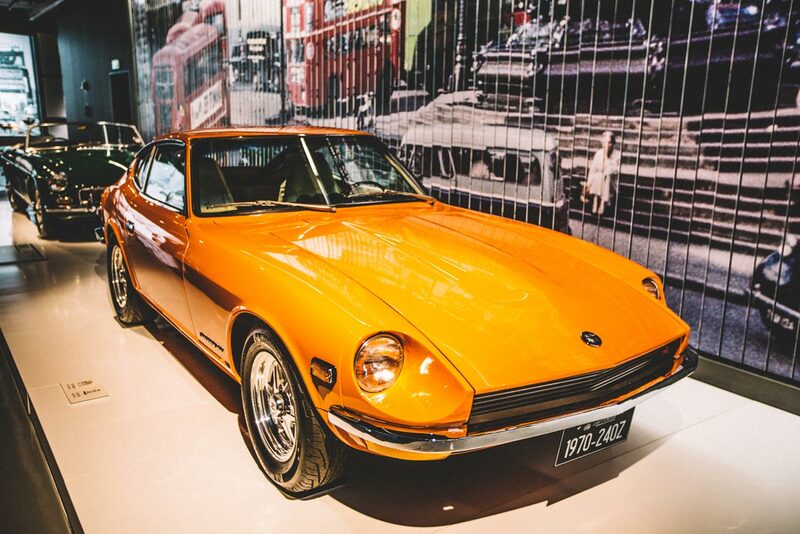 For Japanese car lovers, there is the 1967 Mazda Cosmo, 1970 Datsun (predecessor of Nissan) 240Z, and 1966 Toyota Corolla. 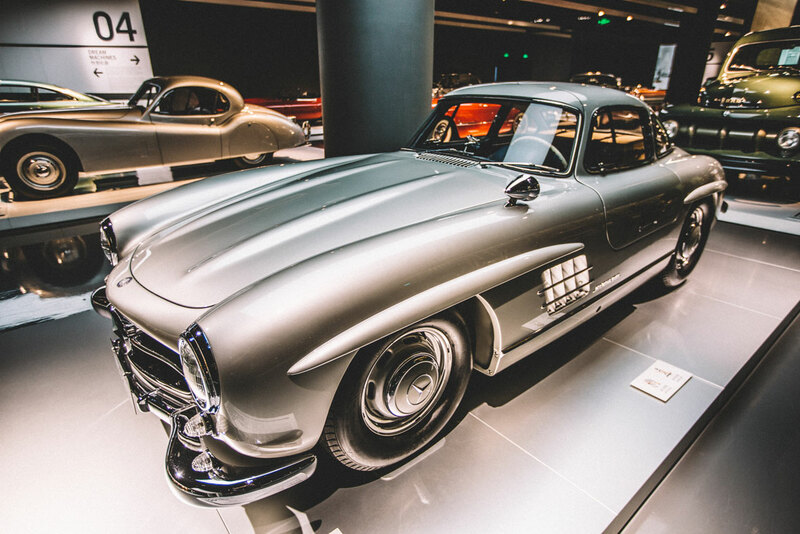 German car enthusiasts will be happy to see the 1964 Porsche 356C, 1960 BMW Isetta and 1955 Mercedes-Benz 300SL. 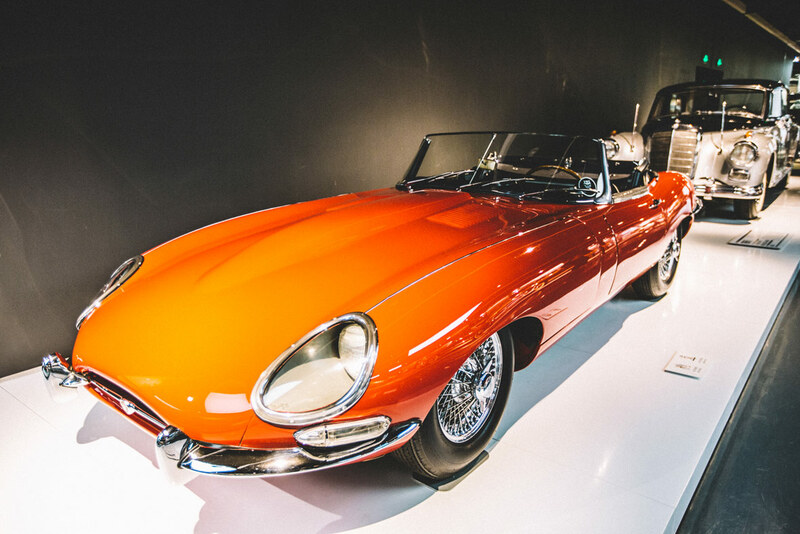 For fans of Italian or British cars, the 1967 Jaguar Type-E, 1951 Jaguar XK120, 1967 Alfa Romeo Giulia GTV, 1929 Bentley 4 1/2 Litre, among others are also on display. 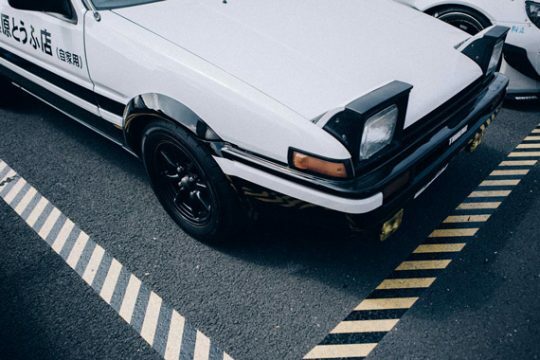 During the 2016 Moving Legends car rally, you could actually spot many of these vintage cars being driven through Shanghai. There was so much to see at the museum that spending just a single afternoon there didn’t feel like quite enough time. The Exploration Pavilion has an interactive movie theater, engine models, and some concept cars, which admittedly was not as exciting to me as the first two pavilions, but definitely still worth visiting. Also parked there are vintage Ferrari Mondials from different years. 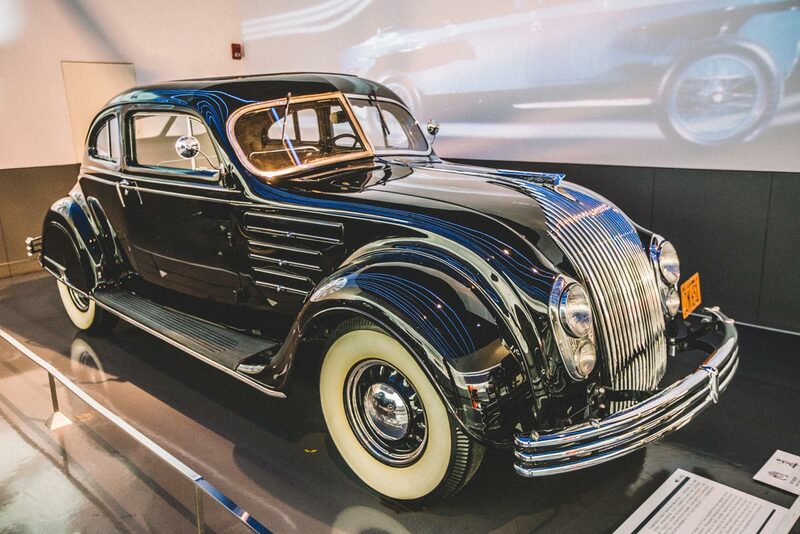 Visitors wondering where all the cars come from might be surprised to find out that most of the vintage cars were donated by American philanthropist Kenneth E. Behring. When you leave, there is a gift shop at the exit, which offers many beautiful model cars for interested consumers, including models made by local Chinese brand Almost Real and the famous German brand CMC. 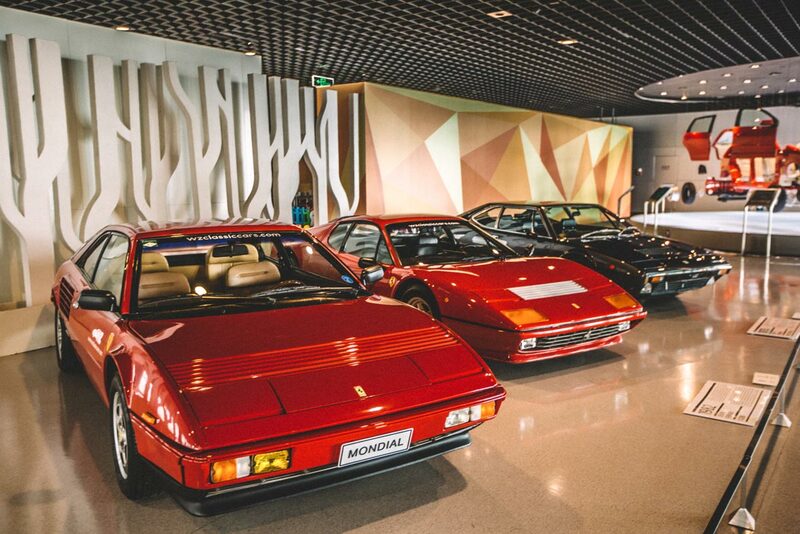 All in all, any car enthusiast visiting the Shanghai Auto Museum will be impressed. No matter if you’re a model car collector like me or a fan of vintage cars, you can find something of interest at the museum. 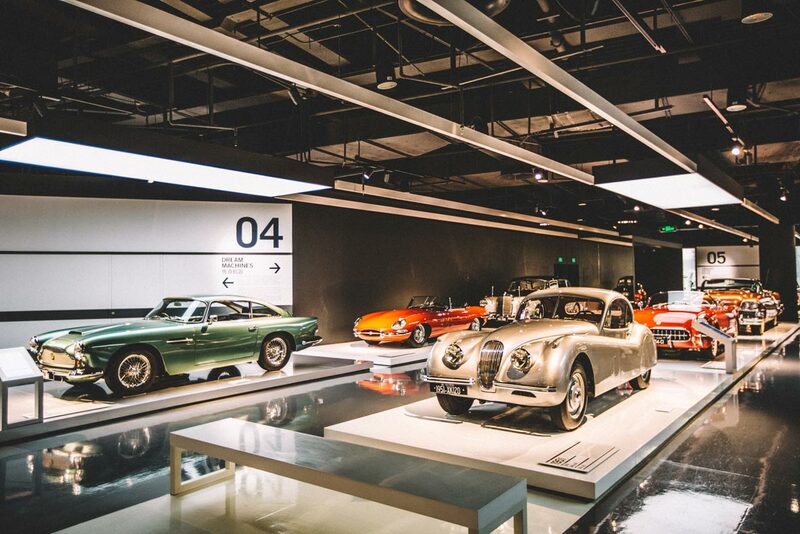 If you’re interested in seeing one of the most impressive collection of vintage cars in China, the Shanghai Auto Museum is definitely worth visiting. 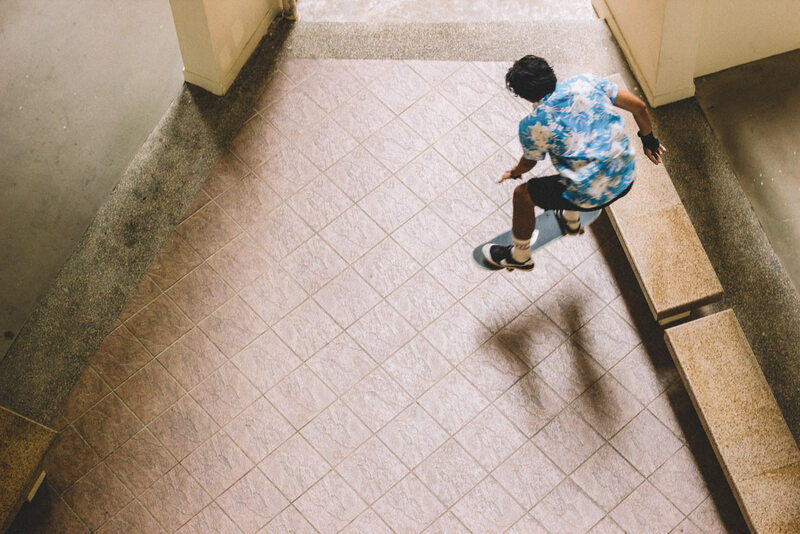 Singapore, otherwise known as the Lion City, is a warm tropical paradise with an ever-growing skateboarding scene. 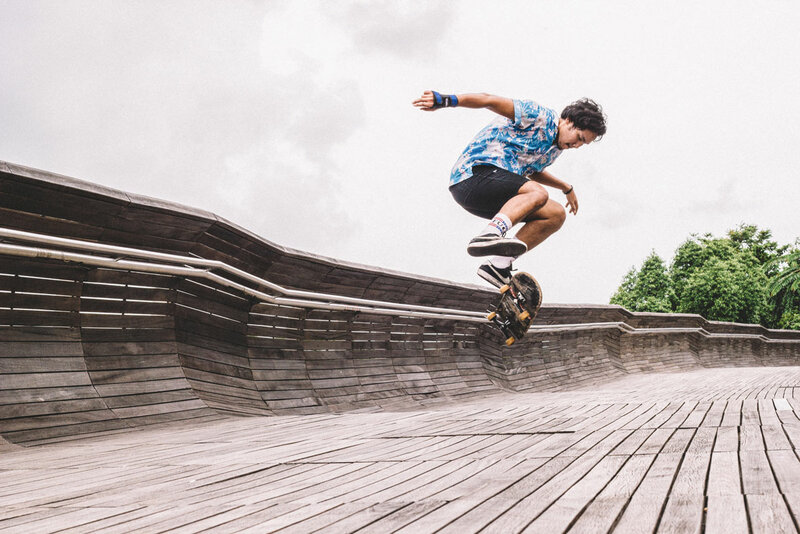 With more and more kids becoming interested in the sport, and with local professional skateboarders like Farris Rahman making his mark in several global competitions, Singapore’s skate scene is rapidly gaining momentum. From illegal to legal, subculture to mainstream, the scene has come a long way. 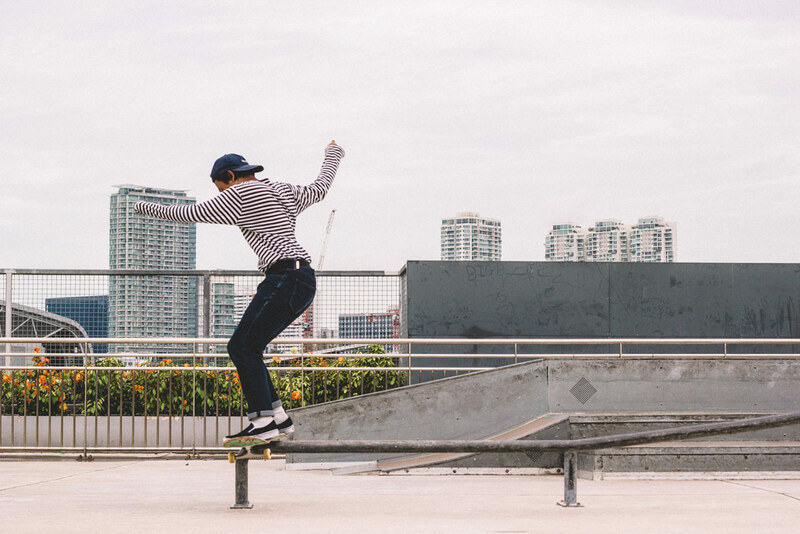 Recently, Neocha sat down with Muhammad Haikal Bin Abdul Rahman, the founder of Singapore-based skater collective Brain Juice, to hear his thoughts on Singapore’s skate scene and how local skate culture has evolved. Neocha: There are many skateparks in Singapore. 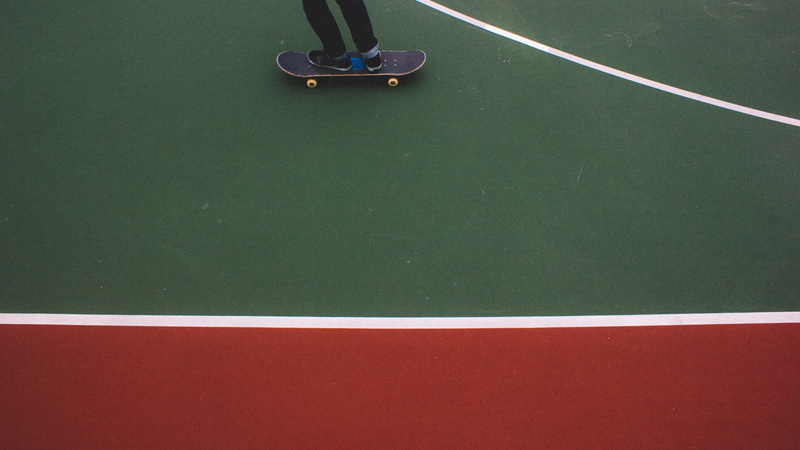 Do you feel like locals prefer to skate in the parks or out in the streets? 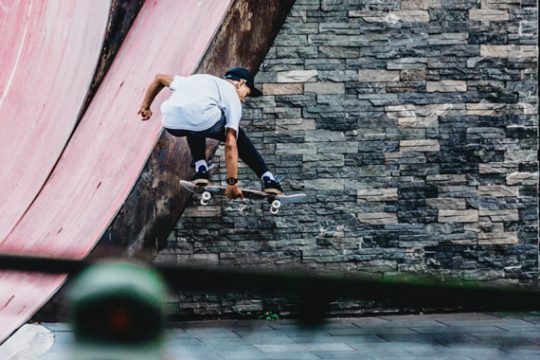 Muhammad Haikal Bin Abdul Rahman: I personally prefer the streets, although nowadays, more skateboarders prefer skate parks as their go-to hangout spot. Many locals like to meet up there and enjoy a nice skate session. To me, a skate park is a place to learn and further develop your skills. It’s a place where you can boost your confidence on certain tricks before heading out into the streets and going down a huge set of stairs, gaps, or handrails. 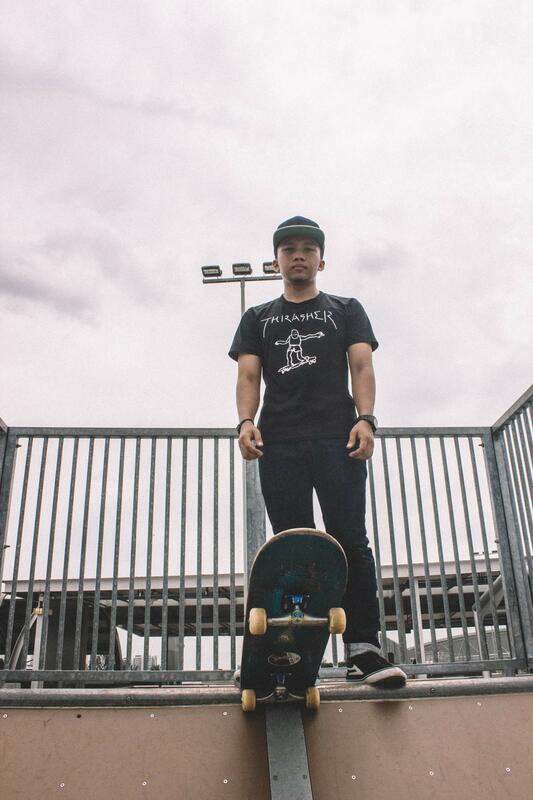 Neocha: Considering how Singapore has fairly restrictive laws, do you guys ever get into trouble for skateboarding? Muhammad Haikal Bin Abdul Rahman: Well, there’s been some minor encounters with the police, with them wanting to check identification or getting kicked out from spots. I’m lucky to have never been arrested or have my board taken away. 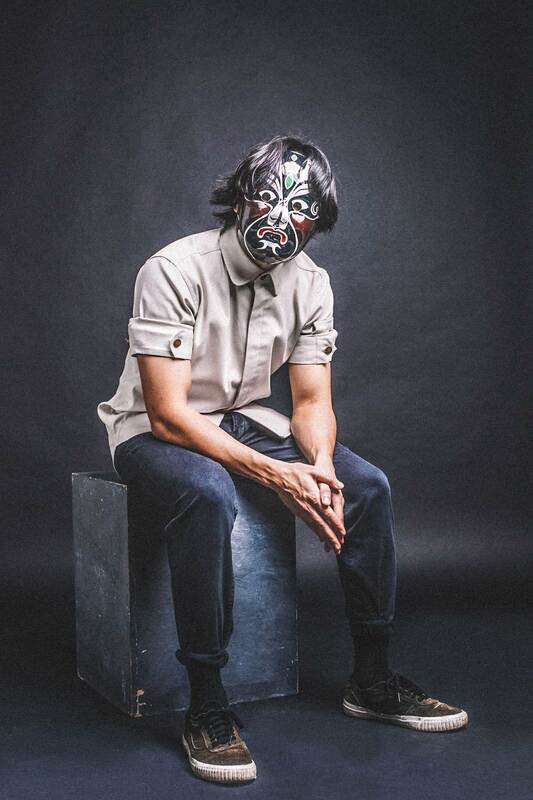 Neocha: With a background as a filmmaker, do you have any plans of making any films about Singaporean skateboarders? Muhammad Haikal Bin Abdul Rahman: There has always been this idea, but right now I’m just finally finishing my national service. I’m slowly working towards it, but for the moment, I just want to take the time to enjoy skateboarding. 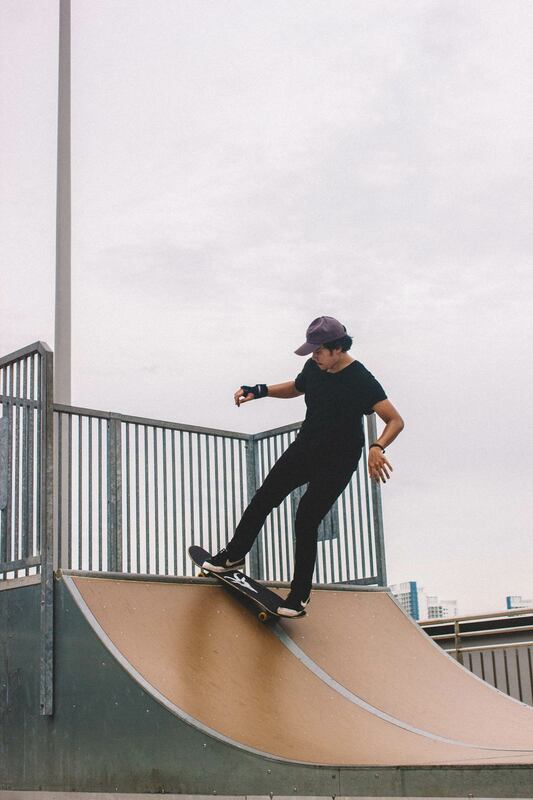 Neocha: How does the general public feel about skateboarding in Singapore? Muhammad Haikal Bin Abdul Rahman: Skateboarding is not something that the public generally approves of. To some people, they might see it as a nuisance, as vandalism, or as if we’re doing something illegal. The public does not see what skateboarders see. Take a set of stairs for example. Most people see them as simply something to help you get up or down, but we see them as a challenge. With the increase of popularity in skateboarding, I hope things will change and more adults will encourage their children to skate. 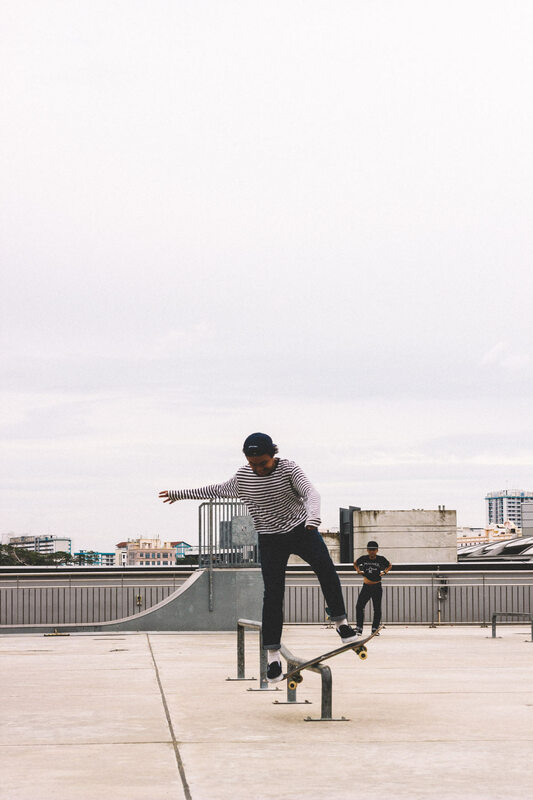 Neocha: For most of the skateboarders in Singapore, do you feel like they’re looking to go pro or is it simply a hobby? 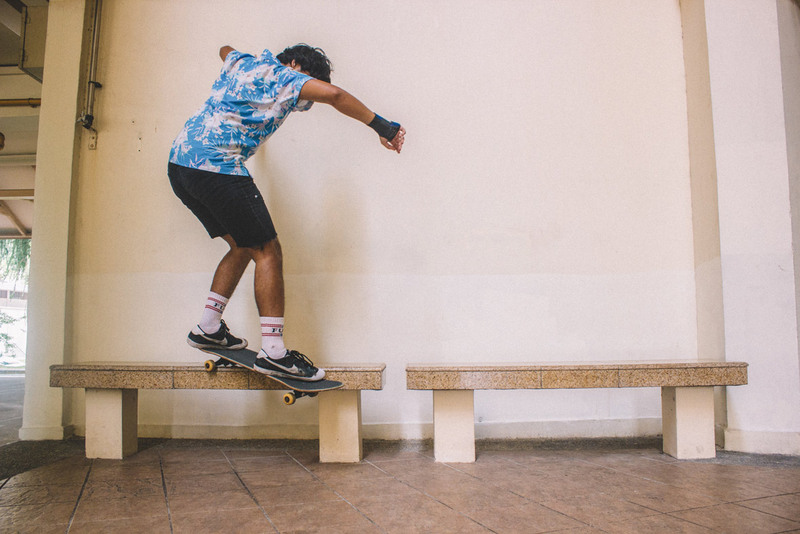 Muhammad Haikal Bin Abdul Rahman: I can’t really speak for others, but there was never a point in my life where I felt like I had to make it as a pro skater. I just feel like skateboarding is a passion of mine. 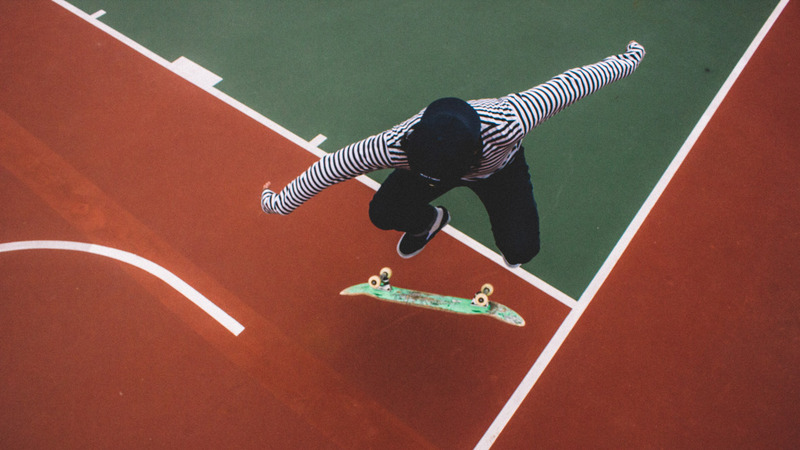 I’m not focused on trying to be an all-out competitive skateboarder. 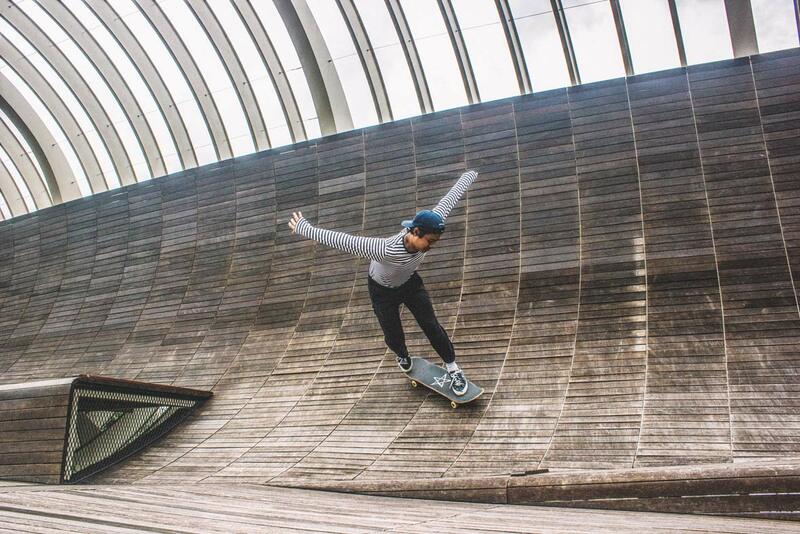 But there are kids shredding and killing it to make their mark, like Singapore’s number one pro skateboarder, who made his name skating in global competitions. Singaporeans competing on an international level at big events such as the Street League and the Tampa Pro will certainly change people’s views of skating in Singapore. Hopefully, it’ll become motivation for the younger generation. Overall, if you love skateboarding and you work hard, I’m certain good things will come and a path will be carved out for you. 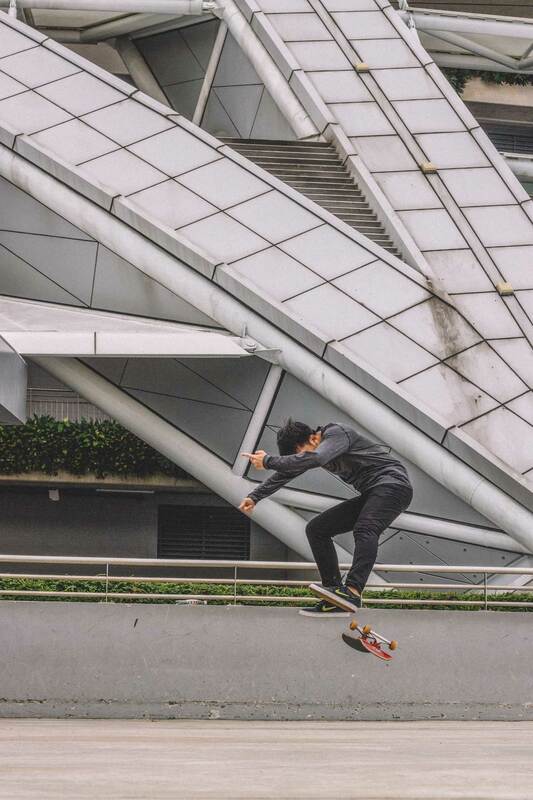 Neocha: How would you summarize skateboarding culture in Singapore? How does it compare to other countries in the region? Muhammad Haikal Bin Abdul Rahman: It’s growing a lot. 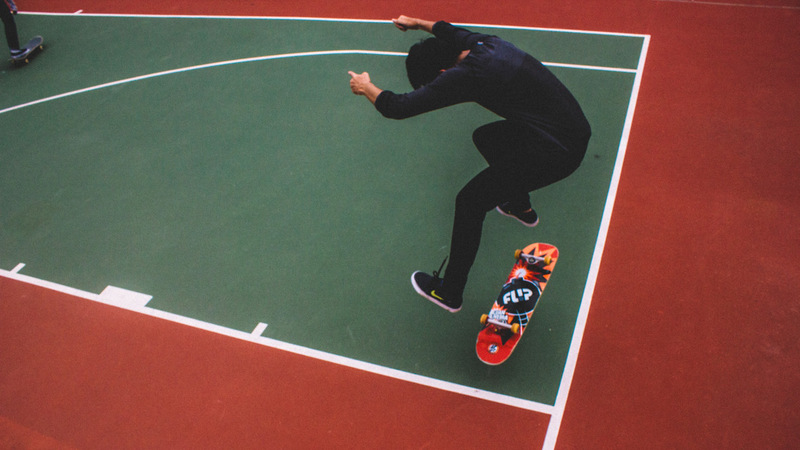 From what skaters wear to their skating styles, the skateboarders are even more diverse now. The only letdown is that Singapore recently had a few skate shops shutdown, and people have realized that skate shops in Singapore does not do well compared to skate shops in other places in the world. 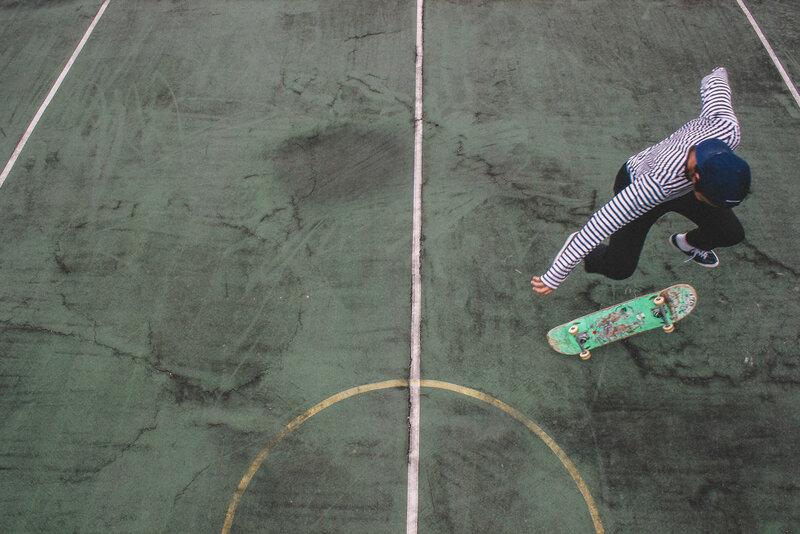 But no matter which part of the world we live in, skateboarding is a common language. 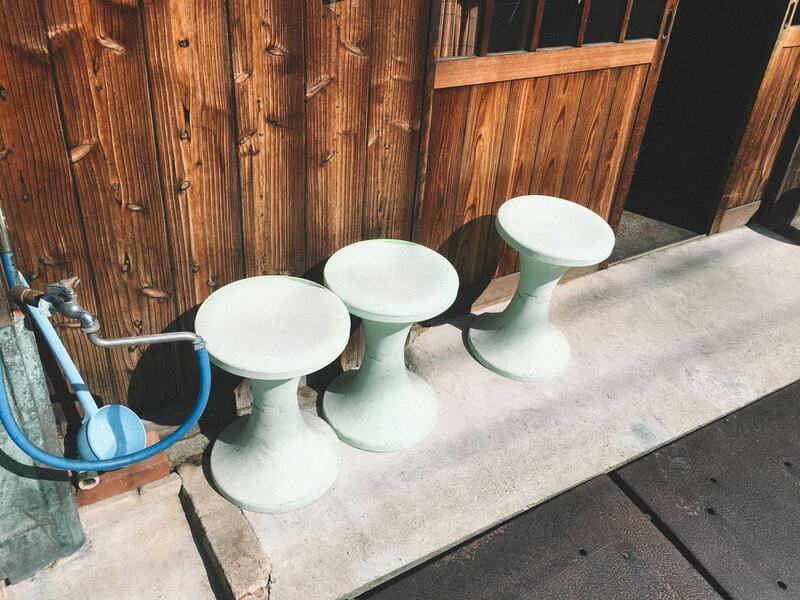 We can just go out and skate, chill out, and have a good time. Neocha: What’s your take on skateboarding being in the 2020 Summer Games in Tokyo, and being recognized as a sport internationally? Muhammad Haikal Bin Abdul Rahman: Wow, I don’t know where to start. For me, it’s mixed feelings. Skateboarding to me has always been a lifestyle, a subculture for the misfits. But seeing it become commercialized and more accepted in the media now contradicts the public’s perception here of skating as being an illegal activity. Skateboarding is now a real sport. There was never a time before where I would consider it as a sport. Now, with the Olympics, it will probably attract a lot of business and marketing. You will probably see more people crowding the skate parks. With all this attention recently from the media about skateboarding, it is definitely quickly bringing everything from the underground to the mainstream. Whatever the hype is, skateboarding will always still be skateboarding. 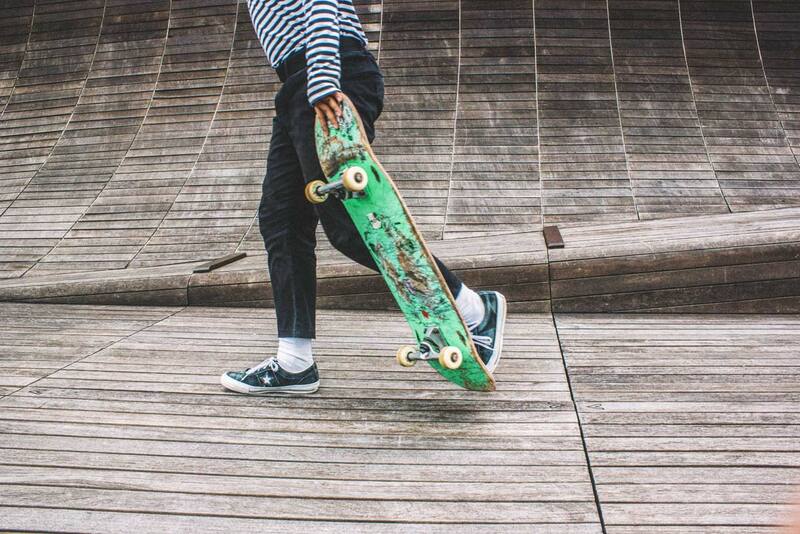 Just go out and skate. 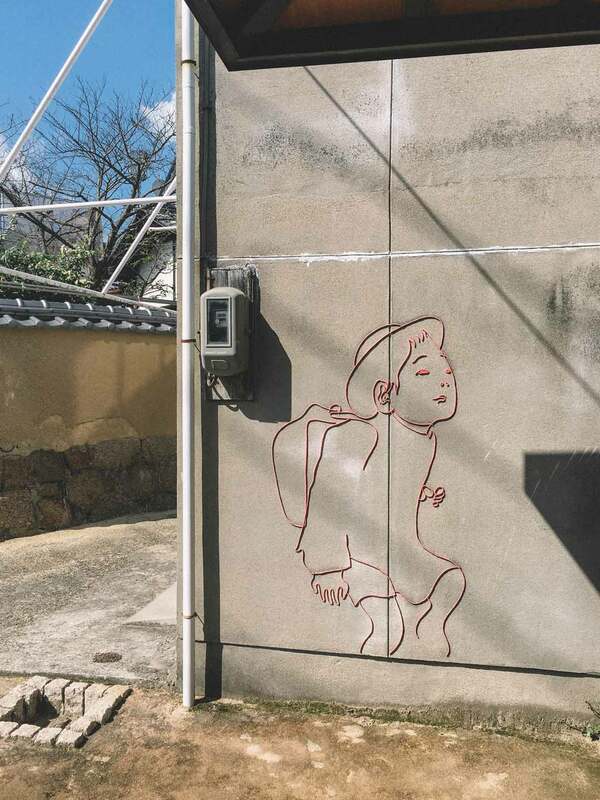 Setouchi Triennale takes place in spring, summer and autumn once every three years and lasts for 108 days. 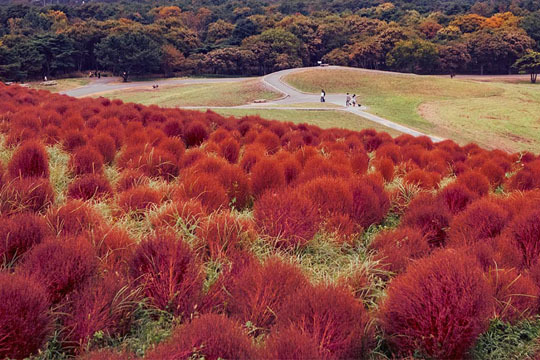 It is held on the 12 islands of the Seto Inland Sea, including Teshima, Megijima, Naoshima, and so on. 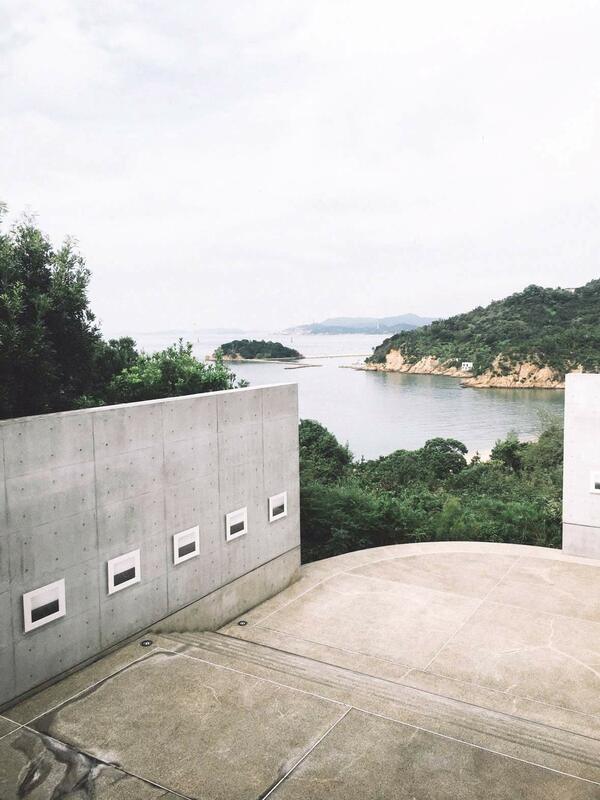 With the largest number of installations and public works on display in Naoshima, this remote island is one of the most popular destinations during the Triennale. 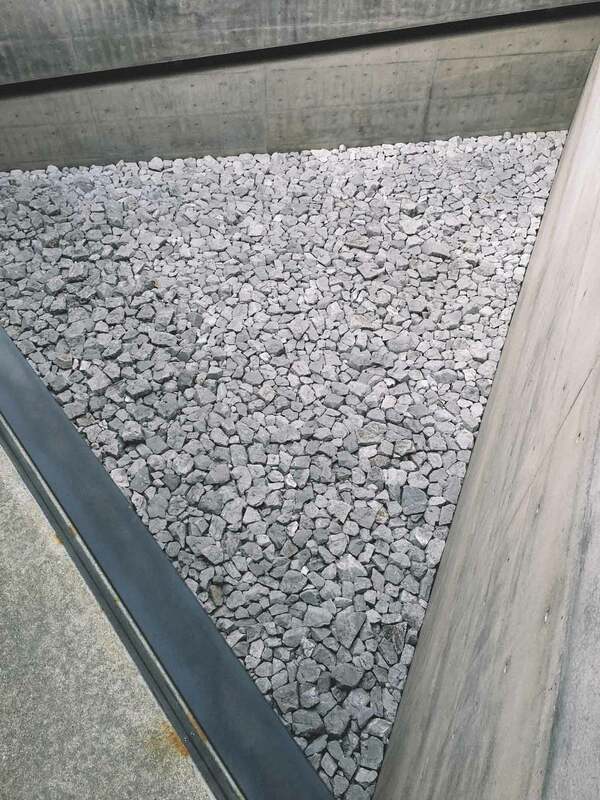 Designed by the world-famous architect Tadao Ando, the Chichu Art Museum lives up to its name (chichu means “underground” in Japanese); a very large part of the museum’s compound is indeed concealed underground. Surprisingly, it manages still to use natural daylight as its main source of light. 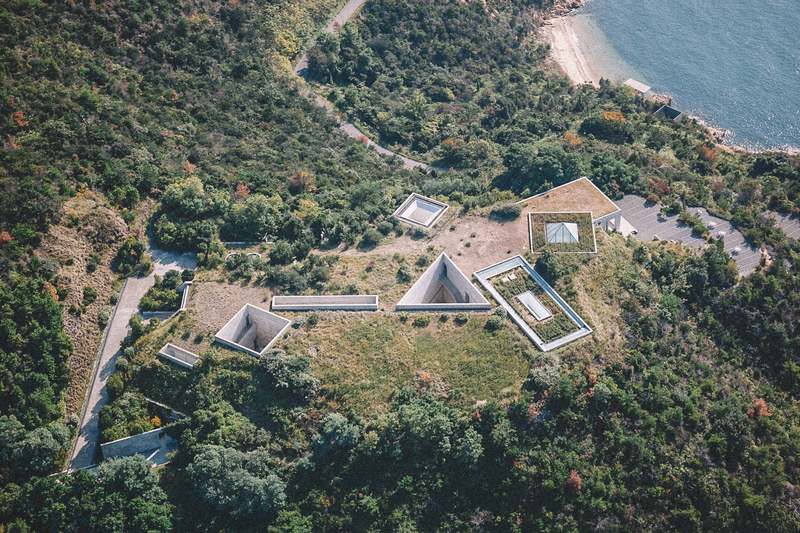 Through Ando’s masterful design, he has engaged in a conversation between architecture and nature. The museum is also exhibiting Time/Timeless/No Time from the iconic American minimalist artist Walter de Maria, Claude Monet’s large-scale oil painting Water Lily, as well as the American contemporary artist James Terrell’s Open Sky – an installation work using light as the medium. It is very rare to witness the work of impressionist, modern and contemporary art in one single museum. 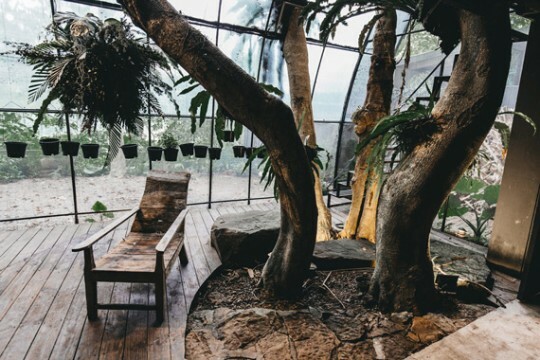 This alone would be reason enough to pay a visit. 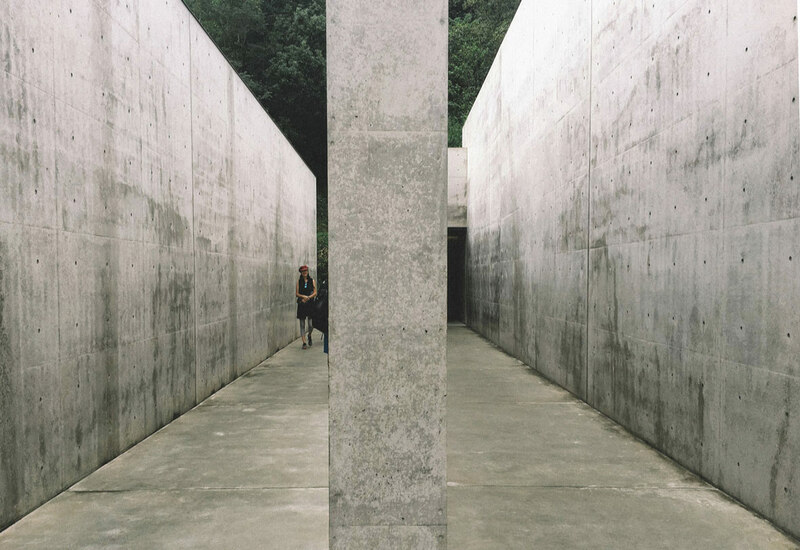 Another must-see museum is the Lee Ufan Museum. Widely considered as the most well-established Korean contemporary artist, Lee Ufan was also one of the leading artists of the Japanese minimalism movement, which has had a significant influence in the world of contemporary art. 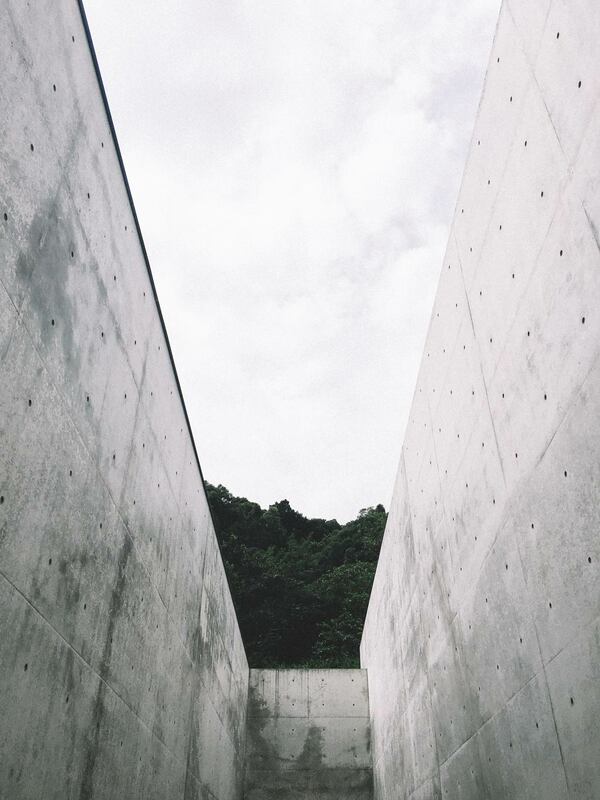 The museum opened in 2010, and is now considered an architectural masterpiece and one of Tadao Ando’s most iconic creations. 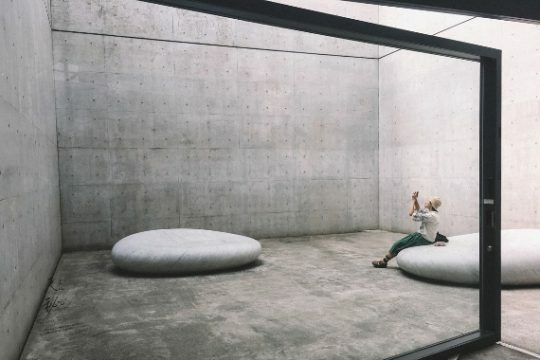 In this semi-underground building, the main visual design elements are the dots, lines, and surfaces; these elements, which are central in the works of both Tadao Ando and Lee Ufan, perfectly compliment each other in the space. 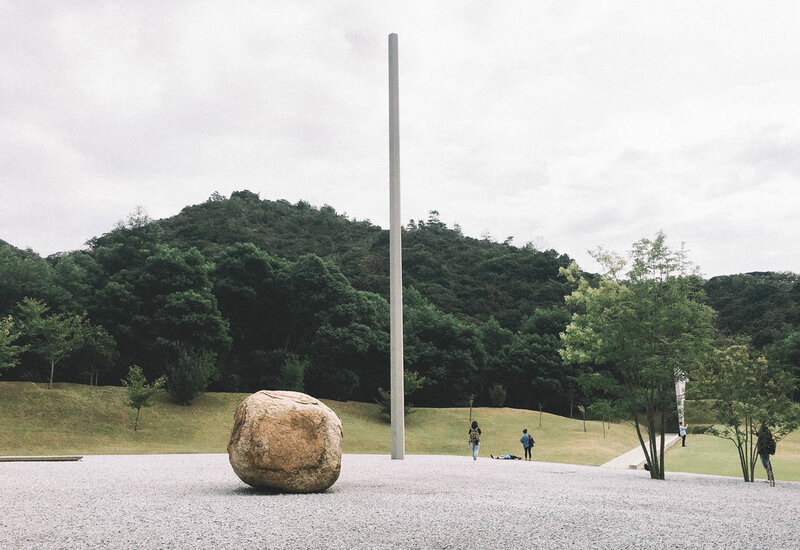 Some of Lee Ufan’s large-scale installations and his early paintings are also on display in the museum. 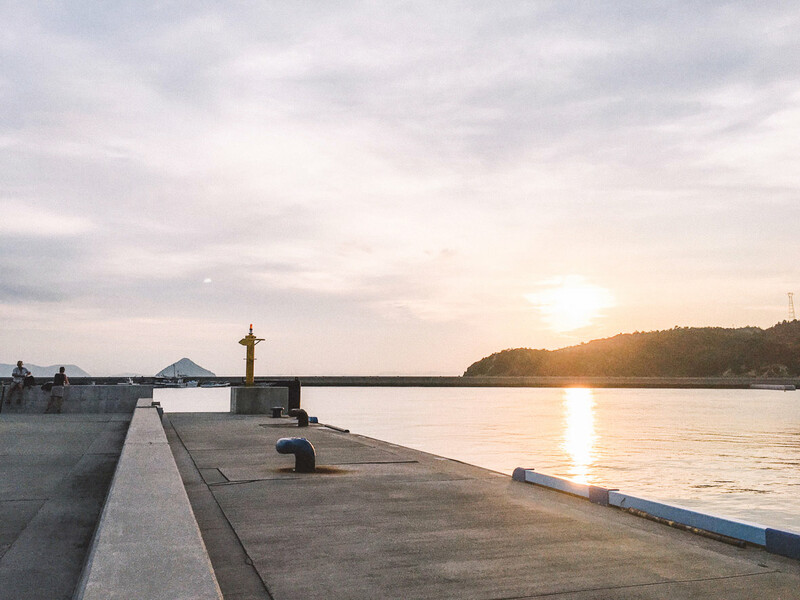 After seeing the museum, visitors can also take a walk to the peaceful harbour of Naoshima where one can get an award-winning ice cream for only 550 yen and enjoy a beautiful sunset. Even though walking is a fairly feasible option for getting around, there are also busses running to most parts of the island. One bus is even decorated in Yayoi Kusama’s signature pumpkin patterns. Also located on the island is the Art House Project, where artists have turned empty houses on the island into works of art. Visitors can easily access all of the revamped buildings by foot after getting off at one of many convenient bus stops. 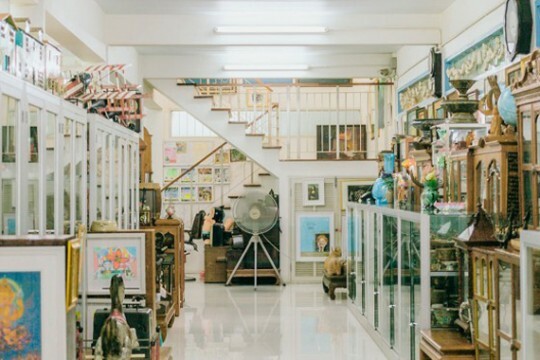 For the purpose of protecting the artworks, photography is forbidden in most of the houses. A local volunteer told me all the works showcased for the Art House Project will be kept permanently. Most of the residential housing on the island are built with wood, standing one next to the other in close proximity. All the windows and doors are smaller than normal, bringing a different yet interesting experience for city dwellers who visit. Even the houses themselves come in rather small sizes. The gardens and plants around the houses are beautifully and neatly arranged in a traditional Japanese style. 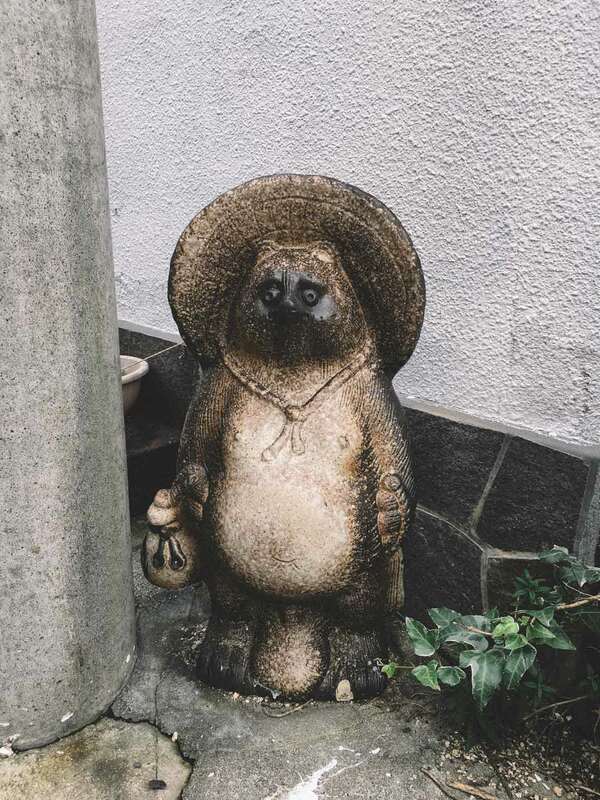 Wandering around, you might also spot interesting details that reveal the tasteful eye of the house owners, such as a cute Tanuki sculpture or artwork made of recycling cans. 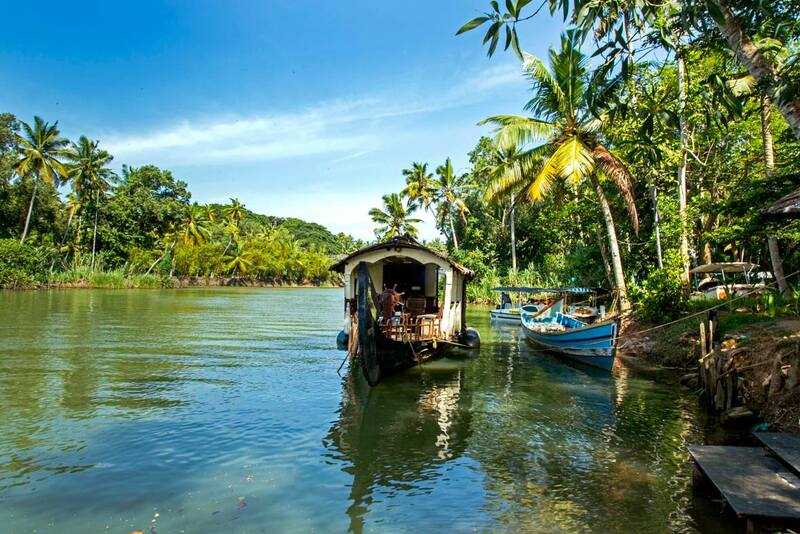 Besides all the interesting museums, the island itself also has a certain charm that it offers. The wooden walls and rusty metal factories add a natural texture to the island, giving it a sense of mysterious beauty that can only come with old age. 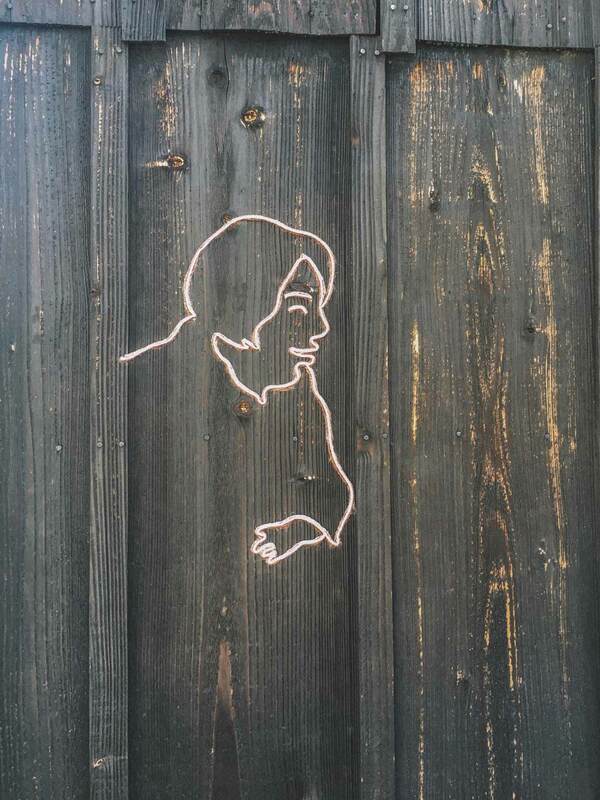 Walking around, you’ll spot even more artwork, such as interesting silhouettes of people made with lines of wool, which are attached to walls throughout the area. They’re often quietly hidden away behind corners, waiting to surprise you when you turn around. 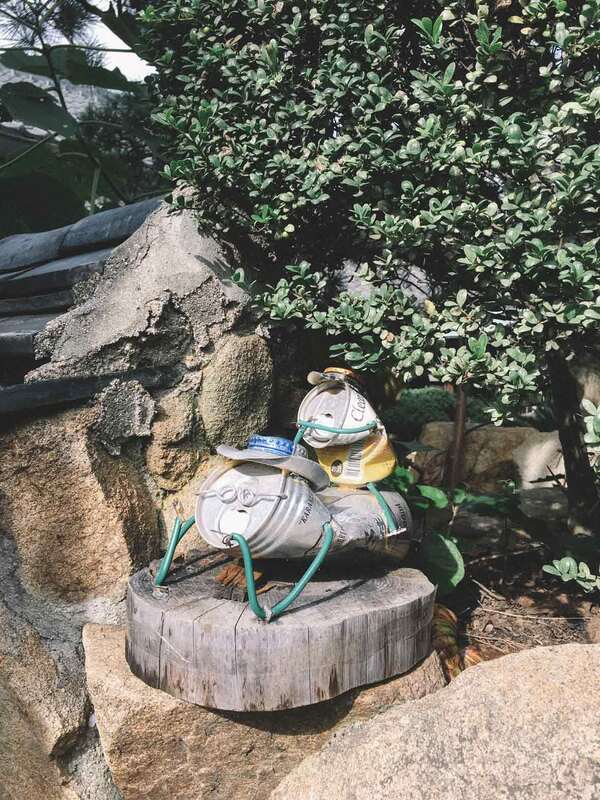 It almost felt like these whimsical artworks were playing hide-and-seek with the tourists. 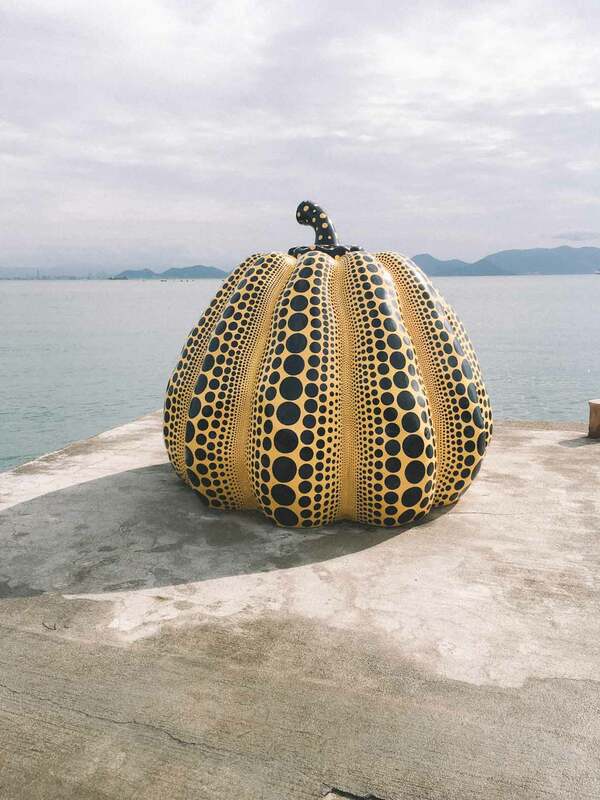 Not far from Miyanoura Port lies the famous polka-dot pumpkin by Yayoi Kusama. It sits quietly by the sea and the water’s blue hues seemed to make the pumpkin’s yellow brighter than ever. Yayoi Kusama’s merchandise can be purchased at the Benesse House Museum, which also showcases other very interesting artworks. 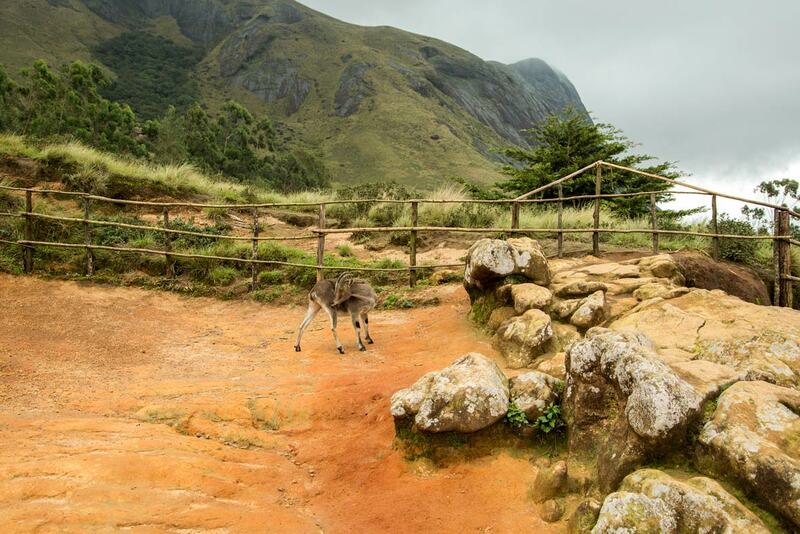 From there, you can head to a café located on the mountaintop to relax with a nice cup of coffee. It is the perfect place to bask in the sunlight, while embracing the gentle wind coming in from the beach. 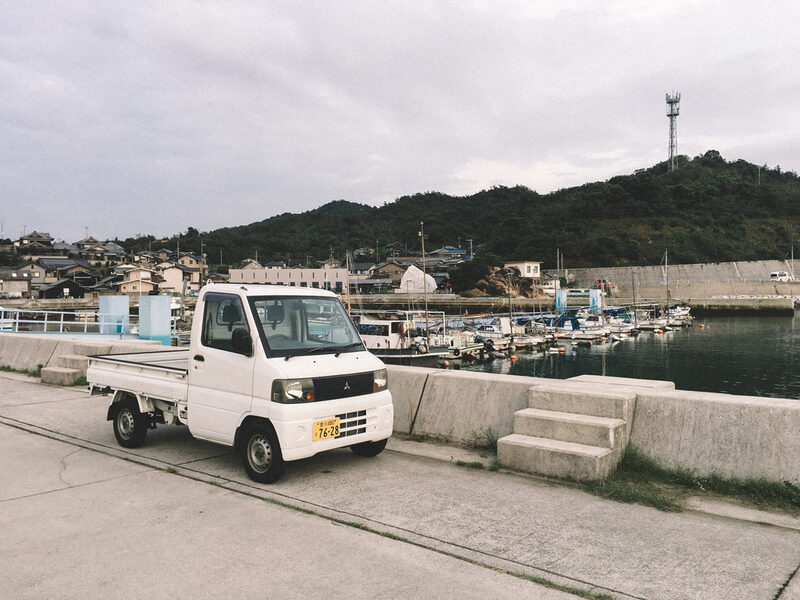 The tranquil vibes of the island, the cutting-edge architecture of the art museums, and the traditional Japanese houses all co-exist harmoniously, perfectly demonstrating the unique nature of Naoshima.